This article is about a family from Meghalaya and their quest to spread the running bug in the state, home to some fine natural-born runners. North Goa and Panjim had drained the overnight bus from Mumbai. Just two people remained for last stop. Stepping off the big bus felt as empty. The Kadamba bus stand in Margao was far from crowded. Being weekend, morning and Goa, there was none of the noise and commotion typical of Indian bus depots. The pilot (Goa’s bike taxi), I hired, drove through streets still indifferent to the time. My hotel – the only one on a rather bare road in Fatorda – made me wonder for a while: what’s happening? Where’s the hustle and bustle? Without it a certain Indian normalcy went missed. Then I hushed myself to my age and stage in life. You have seen enough of that madness, haven’t you? I embraced Goa. That afternoon in Pajifond, an enterprising shop owner helped me find The Cinnamon Tree Project. Usually interviews for this blog feature an individual. This time there was a family. Like freelance journalist born in Kerala, living in Mumbai and now in Goa to meet him, Gerald Pde was a man from elsewhere. 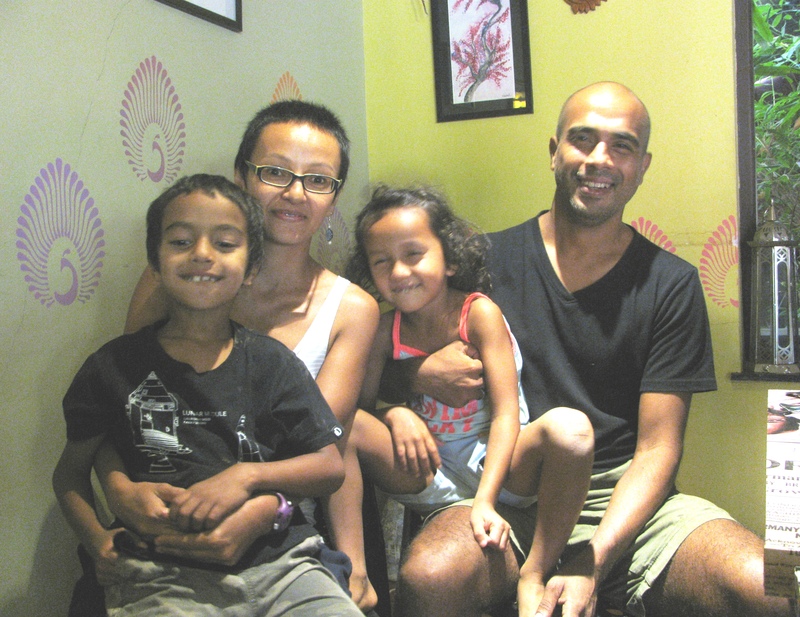 He and his wife Habari seemed to have chosen consciously in life – their children were being home-schooled and for the last two years, the family had spent winter in Goa. Gerald was born 1974 in Shillong, Meghalaya. Along with seven other states, this part of India is generally referred to as the North-East. Connected to the rest of India by the narrow Siliguri Corridor of West Bengal, the North-East is the largest salient (elongated protrusion of a geopolitical entity) in the world. Aside from the plains of Assam, the terrain here is mostly hilly. Gerald was one of four siblings – two brothers; two sisters. His father served in the Border Security Force (BSF). His mother worked in government. He attended school in Shillong and although he never represented his school in sports, Gerald had a unique streak – even as a 7-8 year-old, he loved getting up early in the morning and going for a half hour-run. Very few people ran in Meghalaya’s capital those days. Gerald does not know from where he acquired the trait. He believes his father was into sports for the family has an old photo showing him at the finish line of a race. After school, Gerald set his mind on becoming an architect. From 1994 to 2000, he studied at the School of Planning and Architecture (SPA) in New Delhi. On completing that course, he “ joined the bandwagon’’ of students heading to the US for higher studies. He was accepted at Arizona State University. Upon completion of that course, he moved to New York (he had friends in the city) and started working there as an architect. It was there that he met his future wife – Habari Warjri; she had completed her Bachelors in Business Administration from Baruch College, New York and had just started her first job at Lehman Brothers when they met. More important, although they met in New York, Habari too hailed from Shillong. Her father worked in the Indian Foreign Service and as happens in the family of officials with transferable job, she had grown up in India and overseas. She had been in the US longer than Gerald. They got married in Peru in 2004. In 2008, both of them left New York and returned to India. Gerald set up an architecture and environment design practice in Shillong called EarthStudio. He was there for two years, then, he shifted to Delhi and tried working from there. The Delhi ambiance was not to his liking. So he moved back to Shillong. Habari’s page on Dailymile introduces her as a runner based in Bogota, Colombia. That was one of the places her father was posted to. While studying in the US, she had been into cross country running albeit not long distance. Sporadic running continued in New York; the distance she ran never exceeded 10km in this phase. Many years later, after the birth of her daughter and she was only seven months old, Habari trained in Colombia and ran the New York City Half Marathon, completing it in 2:06. Her first full marathon happened two years after this half marathon; it was the Sohra Cherrapunji Marathon in Meghalaya. When he moved to New York, Gerald revived his running. He was a member of New York Road Runners. After their work stint in New York, the India Gerald and Habari returned to, was different from the country they had known earlier. It was beginning to have a running movement. In 2010, while he was trying out Delhi as place to work from, Gerald said that he was into running but “ not in a serious way.’’ In 2011, things changed. Roughly four years after Gerald completed his architecture program from SPA, the first Standard Chartered Mumbai Marathon (SCMM, now called Tata Mumbai Marathon / TMM) was held in India’s financial capital. By 2008, when Gerald and Habari returned to India, SCMM had settled in as an annual fixture on Mumbai’s calendar. It was the biggest event in a domestic running landscape beginning to sprout more and more events. In 2011, Gerald ran the full marathon at SCMM. He finished second in his age category completing the 42km-distance in approximately 3:23. Two months after SCMM, he ran the Tokyo Marathon with a timing of 3:03:32. He got his personal best in the discipline, the following year at SCMM, running the full marathon in 3:03:21. Since then Gerald has run SCMM every year (he has been podium finisher multiple times) and his list of races span locations ranging from Mumbai to Tokyo, Boston (twice), Bengaluru, Hyderabad, Kochi, Delhi, Kolkata and Goa. Over the past two years, Gerald had been focusing on distances longer than the marathon – the ultramarathon. That is not to say that he moved off marathons; he continues to run events like the Tata Mumbai Marathon (TMM). Just that his natural preference was now favoring the still longer distance of the ultramarathon. “ Maybe the marathon comes across to me as a tight schedule. In ultramarathon, all that structure goes away. I no longer wear a watch while running. I run from one point to another. That process is very fulfilling for me. I find it freer and more meaningful. Compared to this, I find the marathon more commercial and providing a fixed, structured experience,’’ Gerald said. 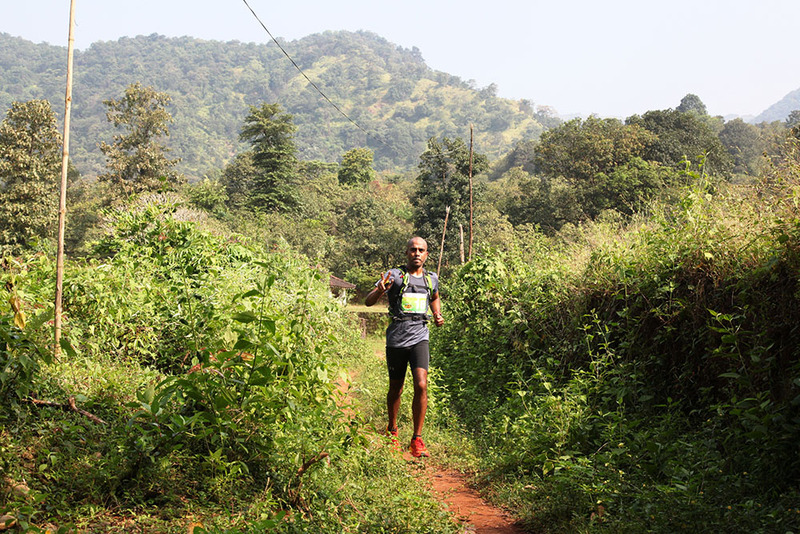 Two weeks after the 2018 TMM, which he completed in 3:14, he ran the 80km-category of the Kodaikanal Hills Ultra. He finished that in 10:15. “ I run TMM because it is like an annual pilgrimage. It is tough to secure a fast time in Mumbai given the weather, the Peddar Road gradient and the inevitable rendezvous with half marathon runners,’’ he said. In 2013, he had attempted to secure sub-three hours finish in Mumbai. But that wall of half marathon runners ensured he slowed down. Dan Lawson is a British ultra-runner and charity worker. 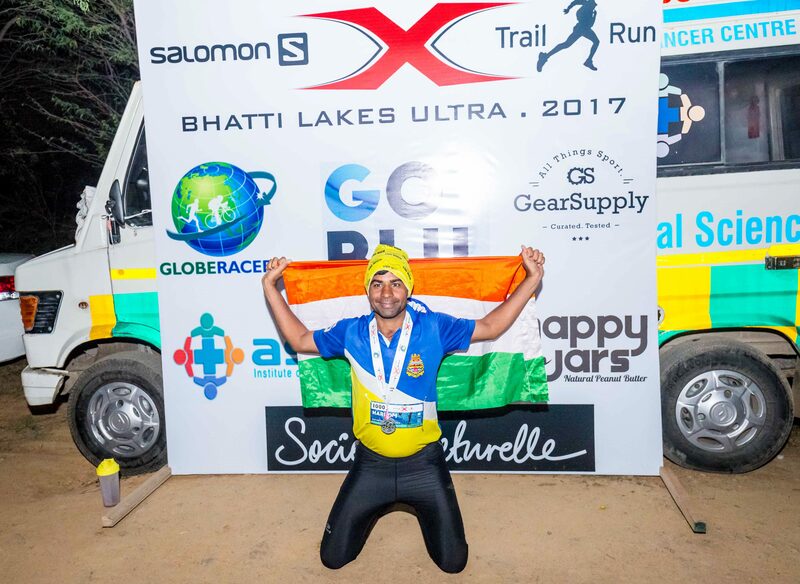 Winner at the European 24 Hour Championships in 2016 and a podium finisher at Spartathlon, he has also been a winner in India at races like Run the Rann, Nilgiris Ultra and Bangalore Ultra. At the last named event, he set a record for the maximum distance run in 24 hours in India – 226km. Dan Lawson is Race Director for an ultramarathon in Goa called Paradise Trails, a 101km-UTMB qualifier. 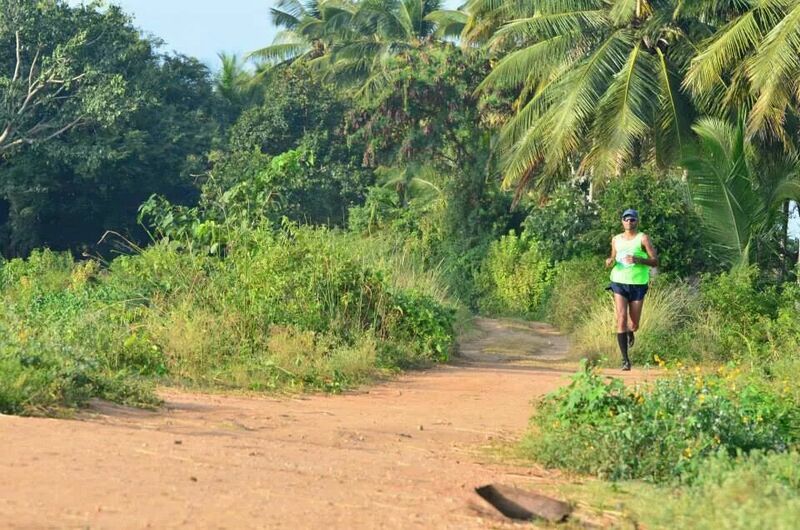 The course spans a mix of Goan scenery – beach, countryside, forest, hills and villages. Ever since he started spending the winter in Goa, Gerald has liked running in the coastal state. Unlike Shillong which has caught that modern epidemic of the hills – vehicular traffic, the village roads of Goa are quieter. “ Where we live in south Goa, there is less traffic,’’ Habari said. There is also another difference. Although the hills of North East India harbor much talent in sports, runners out on the road every day is a phenomenon that is still catching up. Running in South Goa, Gerald said, he witnesses less traffic than in Shillong and more runners on the road, the latter also because Goa as tourist destination attracts plenty of recreational runners from around the world. After meeting Dan and learning about the race he oversaw (it started and ended a few minutes away from where they stayed in Goa)l Gerald decided to attempt the Paradise Trails Ultra of November 2017. It was tough. “ You are given a GPS with route laid out. You have to follow it. The route is not marked. That made it difficult. I got lost a few times,’’ Gerald said. He completed the race in 14 hours and 10 minutes. Gerald was the first to cross the finish line and having Habari and children there was a memorable moment for the family. He plans to try it again in 2018. 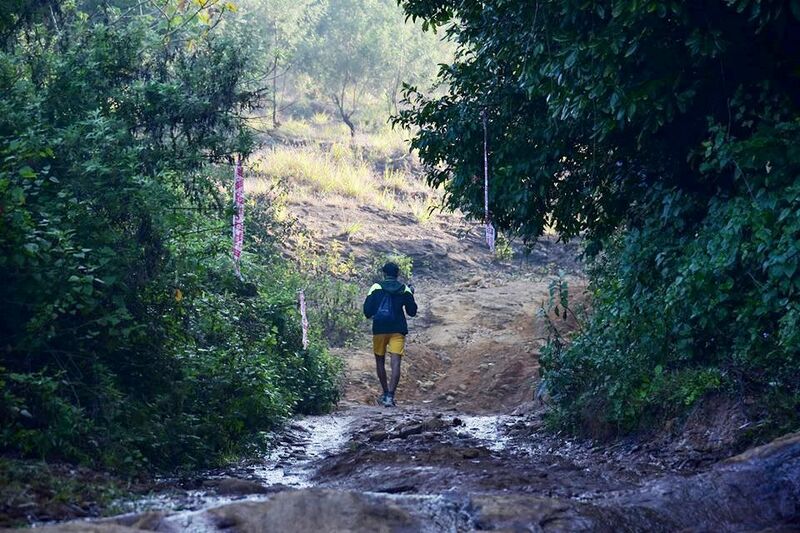 The longest distance Gerald had run before Paradise Trails was a 60km-run he did in Meghalaya as part of scouting a route for a race he was organizing a week before the 101km-race in Goa. In fact, aside from their own running, what makes Gerald and Habari interesting from the perspective of running in India is the work they did to promote running in Meghalaya. A hilly state, Meghalaya offers some unique attractions. To begin with, it is one of the wettest areas on the planet with Cherrapunji holding the world record for most rain in a month. The western parts of the state are at lower elevation and hence warmer; the east – including Shillong, the capital (elevation: 4908 feet) – are at higher elevation and hence cooler. According to Wikipedia, the maximum temperature in the Shillong area rarely exceeds 28 degrees Celsius. The British, who once ruled India, called Shillong “ Scotland of the East.’’ Although rain can be an issue, the rolling hills and the never too hot weather, makes this region engaging for running. However until some years ago, Meghalaya had no formally arranged large event in the sport. 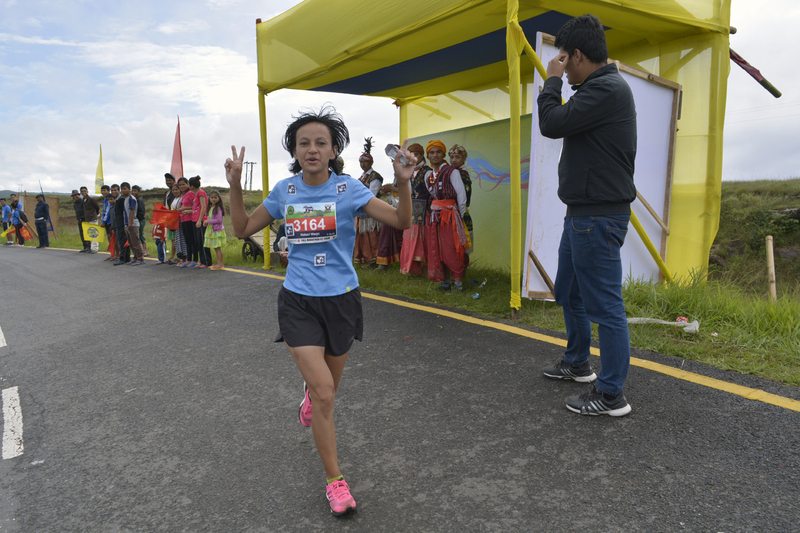 In 2013, as part of the state’s autumn festival, Gerald and Habari, in collaboration with state authorities, organized a Shillong Half Marathon, the first event of its kind in Meghalaya. “ It went off quite well,’’ Habari said. This event was the seed for RUN Meghalaya, an initiative Gerald and Habari founded, wherein they raised funds to take talented runners from the state to run at city marathons elsewhere in India. Commencing with the 2013 Airtel Delhi Half Marathon (ADHM), they have since taken Meghalaya’s runners to the Mumbai marathon and races in Bengaluru, Hyderabad and Kolkata. The first outing to ADHM was realized through crowd funding. Thirteen runners participated under the RUN Meghalaya initiative. Almost all of them placed in the top 10 in their respective categories with the fastest runner completing the half marathon in 1:13. According to Gerald and Habari, although they have persisted with RUN Meghalaya, there are challenges. There is for instance, noticeable gender imbalance in the region’s running culture; as yet women runners are few. Specific to RUN Meghalaya, funding remains main challenge. “ After every year, we have to start all over again,’’ Habari said. In general, finding corporate sponsors for events in India’s North-East is difficult because the region does not represent a big market. A silver lining is that government agencies assist. However governments change frequently. The Shillong Half Marathon and later events the duo helped organize, like the Sohra Cherrapunji Marathon, received some support from government. 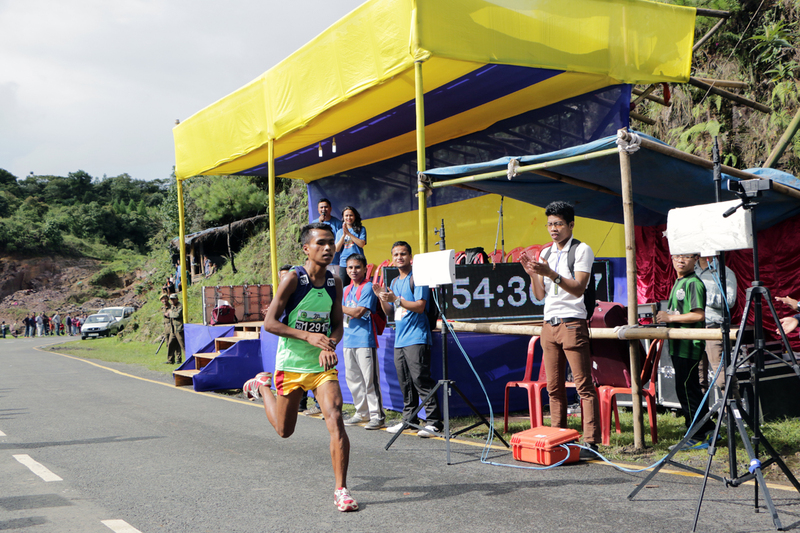 For the first edition of the Cherrapunji Marathon in 2014, there was only one runner from outside the region – Vishwanathan Jayaraman. According to Gerald, Jayaraman’s article on the event hosted on his blog, helped publicize the Cherrapunji Marathon. Although he didn’t participate in an event there, Athreya Chidambi is another runner who sampled running in Shillong. “ They have good runners,’’ he said in a later conversation with this blog in Bengaluru. By 2015, the Cherrapunji Marathon saw 1500 runners. But an event’s stature is founded on more than just scale of participation. As Habari and Gerald found out, all it takes to dent image is a shortcoming or two. 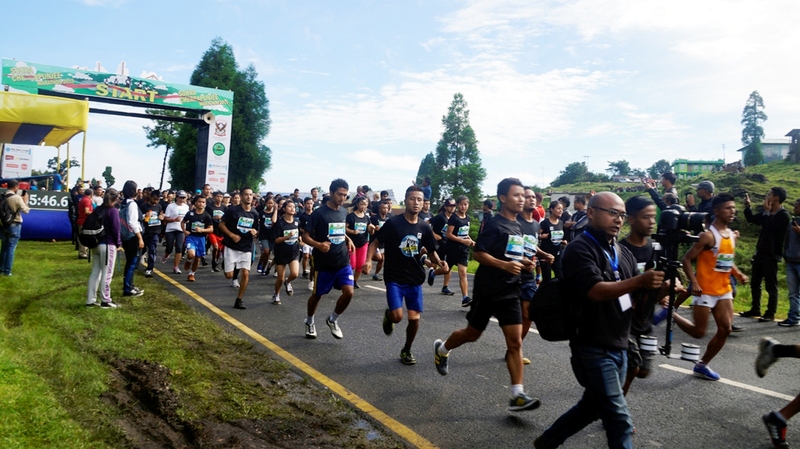 For its third edition, the Cherrapunji Marathon attracted close to 1700 runners. That year – 2016 – the weather played truant. While you can’t imagine Cherrapunji without rain in the frame, rain was more than enjoyable measure on race day. “ It strained race logistics,’’ Habari said. Result – the organizers came in for a barrage of negative feedback. Runners used to events are a different breed from those who approach the activity in a more spontaneous, organic way. When the barrage of negative feedback hit them, Gerald and Habari wished there was some empathy shown for the effort that goes into organizing an event in hilly terrain amid inclement weather. They wondered if this had something to do with the half marathon and marathon reducing over time to structured, stereotypical events; promising guaranteed return on money paid. Such conditioning spares little tolerance for variables like weather, hiccups in logistics etc. It is one of the inbuilt paradoxes of sport as event. Packaged so, notion of the unpredictable as part of life – an integral part of being free and enjoying it – is leached away. According to Habari what made the feedback particularly difficult was that it was on top of their family life already squeezed by the pressures of organizing an event. “ He was always running around to get things done. We hardly got to see him,’’ she said of Gerald. Another factor also influenced their thinking after the 2016 edition of the Cherrapunji Marathon. A race anywhere passes through multiple localities. Ideally these localities must participate and support. In a big city like Mumbai, governed by one large municipal corporation, continued sense of locality is cosmetic. It is for all practical purposes one big metro. Organizers backed by civic authorities can ensure things happen as planned everywhere along the route. That is not so in the North-East where sense of tribe and tribal ownership of terrain prevails. You have to engage with each of those constituents and get them interested in the event. 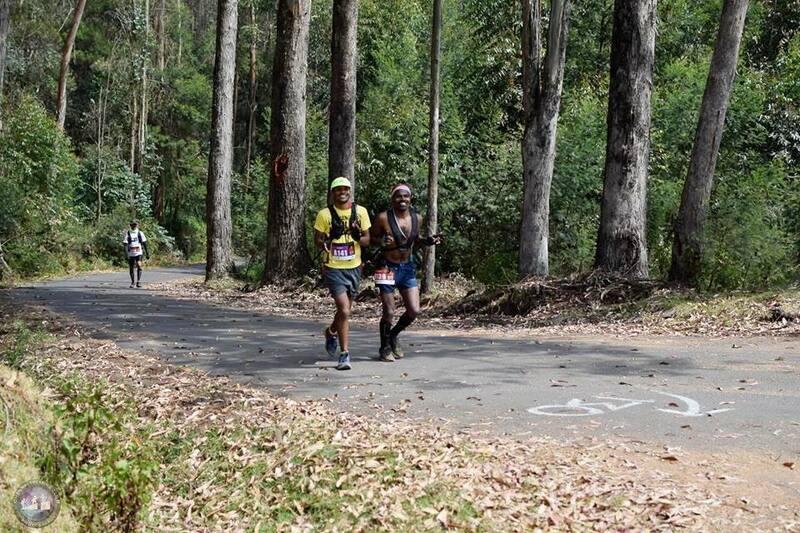 Support for the Cherrapunji Marathon, Gerald and Habari felt, wasn’t uniform all along its route. Not all communities on the race’s route seemed to have bought into the idea well. They felt there was the need to reinvent the wheel – create a new model where running is again revered and its inherent joys are rediscovered. This juncture precipitated by a convergence of various factors, Habari said, was when the duo started to look at organizing an ultramarathon instead of a marathon in a place that embraces running. While they were arranging races in Meghalaya and finding runners to sponsor for races elsewhere in India, the duo had also been getting an idea of where the state’s best runners were coming from. “ Almost 90 per cent of the good runners were coming from one region – Mawkyrwat. Within that, they were mostly from two villages close to each other – Sakwang and Shngimawlein,’’ Gerald said. The reasons for this can only be speculated and range from – difficult terrain to generally active life, good running form and a diet dominated by locally grown organic red rice. Mawkyrwat liked running. This is how the idea of the Mawkyrwat Ultra was born. The location would be a place with resident running talent; one of the aims would be to potentially open up a second economy in the form of “ running tourism’’ that can monetarily help runner families from humble backgrounds. The ultramarathon was chosen as discipline based on the belief that it’s seasoned, older participants or at the very least those weathered by nature, appeared a comparatively more serious community of runners to deal with. Three distance categories were marked – 70km, 45km and 30km. The event – largely on trails – is designed to benefit the local economy, Gerald said. Woven into the concept of the ultramarathon is the idea that runners should get a feel of life in these parts. It is hoped to be a mutually beneficial transaction with runners from outside getting a chance to run in rural Meghalaya and local runners, getting a chance to meet runners from elsewhere in India and overseas. The inaugural edition of the Mawkyrwat Ultra was held in 2017. Among those who participated was Suresh Zimba from Darjeeling. “ The location was roughly three hours away from Shillong. It was a rustic setting with the villagers leading a simple life. We stayed with the villagers, in their houses. They took good care of us. The race route was very nice. It was mostly trail with some road. The run went through the main town as well. I participated in the 70km-category. I think about a dozen people ran in that category. Participation was higher in the other categories. Given it was the first edition, the race wasn’t well known,’’ Suresh said. As regards funding of the event, half the required amount is provided by Gerald and Habari with the rest coming from the state’s tourism department and through registration fee. The running is self-supported and the race has been certified by the International Trail Running Association (ITRA). It is the only such race in the east of India; it also offers UTMB points. The second edition of the race is due in October 2018. Given the family’s annual move to Goa and emergent focus on other aspects of life like their children’s education, running and the events they organize, EarthStudio progressively took a back seat. “ I still work on selected projects but do not take up more than two design projects a year,’’ Gerald said. At the time of writing, Habari was helping him in some administrative aspects of the design practice. What people are and what they do in life are often mutual reflections. “ My work as an architect and environmental designer and my passion for running – they have some correlation. For example my work deals with utilizing the laws of nature to dictate design decisions – to come up with buildings that try to respond to the nature around us such as light, wind, the Sun and natural materials. Similarly over the years I have found running to appeal more to our natural selves. The more we run the more we realize how connected with nature we are – you can only push one’s running capabilities as much as nature allows you to and so the more we push the more we are humbled by it,’’ Gerald said. Sunday evening at the Kadamba bus stand was different from Saturday morning. Working days ahead had made their presence felt. Tourists were returning to wherever they came from. Not all seemed happy to do so; the disappointment in going back to an all too familiar life showed in the facial expression and body language of some. Mercifully, freelance journalist wasn’t among those reluctantly returning. It was a smaller bus this time. Destination: Bengaluru. This is an article by invitation. 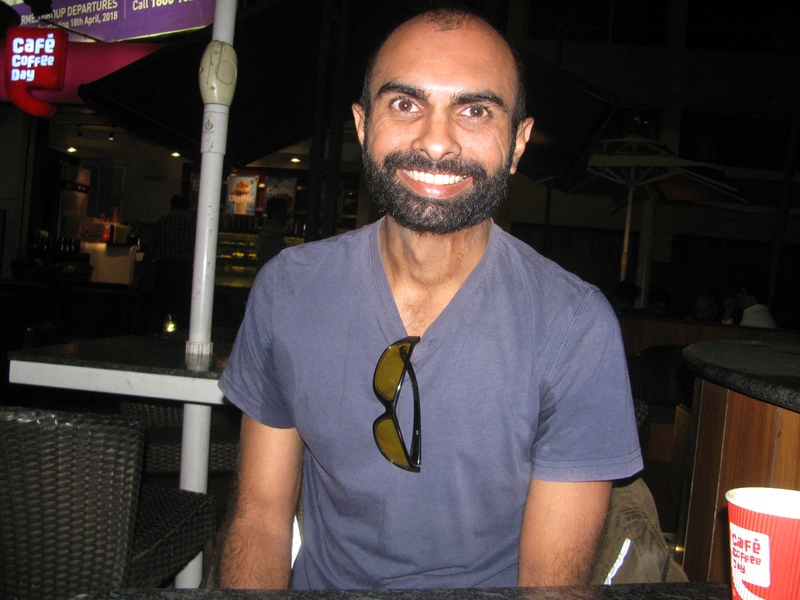 The author, Ramachandran, is an entrepreneur and runner based in Coimbatore. 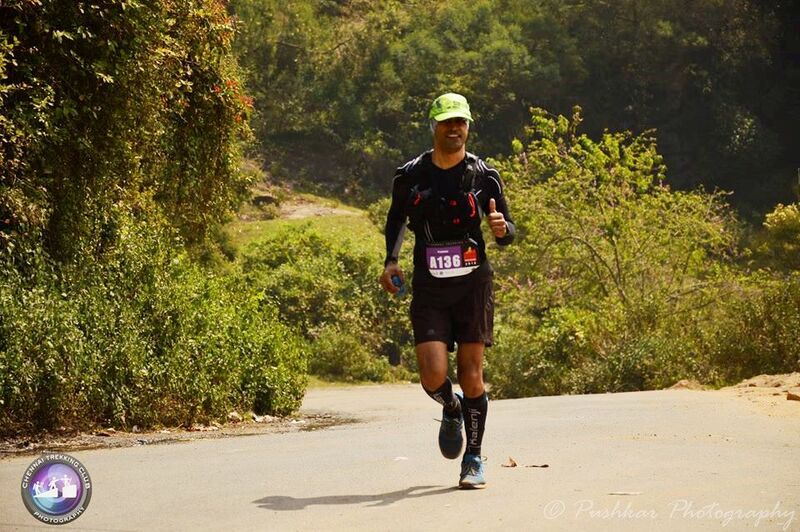 Here he writes about his experience, running the Kodaikanal Hills Ultra. Kodaikanal is one of the best known hill resorts of South India. The main town, located at an altitude of over 6900 feet, is on a plateau on the southern escarpment above the upper Palani Hills, between the Parappar and Gundar valleys. These hills form the eastward spur of the Western Ghats in southern India. Kodaikanal is roughly 120 kilometres north-west of Madurai, the third biggest city in the state of Tamil Nadu. January 27, 2018, early morning 2.30AM, around 100 runners scheduled to run the 130 km and 80 km-distance categories of the first edition of the Kodaikanal Hills Ultra assembled at the Kodai International School ground. With the temperature at around 10 degrees most of the runners were fully covered. Many were equipped with headlamps and hydration gear for running 12 hours plus. Upon reaching the venue, my running buddies from Coimbatore and I, engaged in warm-up exercises, both to limber up for the run and to stay warm. 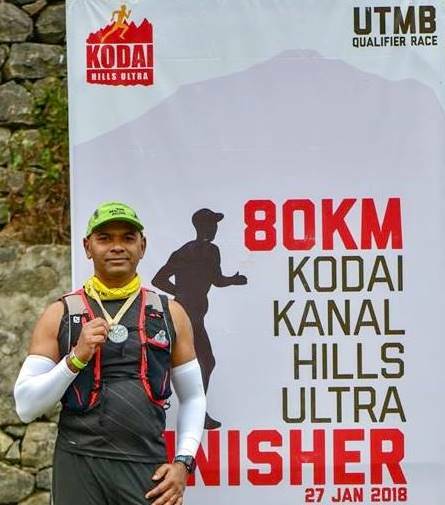 When the first edition of Kodaikanal Hills Ultra was announced with categories of 130k, 80k, 50k, and 20k to accommodate runners of various competence levels, I decided to participate in the 80k as it would be my first event after two years lost to running injuries. I created a training plan based on Jason Koop’s book Training Essentials for Ultrarunning. Much of my weekday training consisted of interval training and tempo workouts. Weekends were dedicated to long, endurance runs. I ran for six hours a week in October and gradually increased it to seven hours in November and eight hours in December and January. Since Coimbatore is close to the Western Ghats, I am lucky to have few small hills near my house. Starting from December I did my long runs in the hills of Paalamalai which has a three kilometre-steep climb and a trail route of five kilometres at the top. I alternated it with the rolling hills of the Anaikatti range. My last three long runs were for six hours on those hills. I included plenty of fast walks and practised downhill running as both would be a very important component of any ultra-run. I also did three days of weight training every week to strengthen my core and did foam rolling after every run to prevent injury. On race day, the run started at 3.15 AM due to a delay in drop bag collection. It was a sight to see hundreds of head lamps lighting up the roads of Kodai. We ran towards Poombarai which is 20 km from the start. The route was mostly downhill with some small climbs where I switched to fast walking. My strategy was to walk the uphill sections and run the flat and downhill sections. After four hours I reached Puthuputhur aid station covering 35 km. From Poombarai to Puthuputhur, it was mostly steep climbing. I fortified myself with two sandwiches. 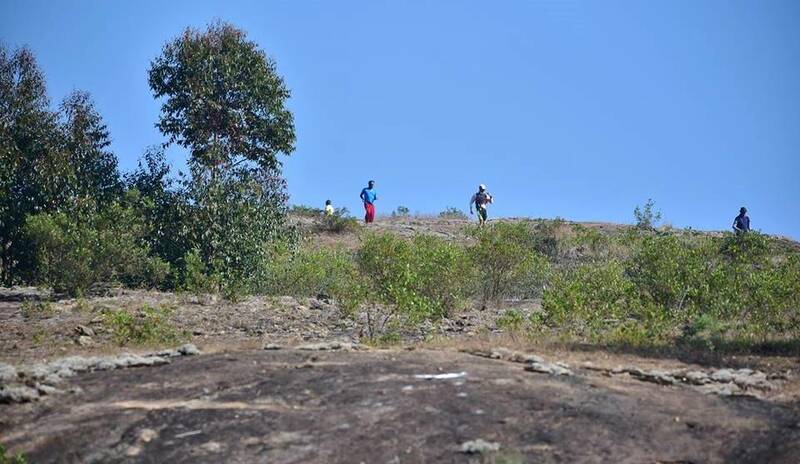 We ran a loop of 10 kilometres on trails with difficult mud paths and a steep hike to reach Palar View Point. Then we navigated back to the same Puthuputhur aid station. I ran towards Kookal Lake passing through vegetation and mud tracks. The road to T-Junction from Kookal Lake was a difficult uphill segment and I walked much of the distance. From T-Junction to Moir Point was an arduous hike of 26 km. By now I had covered a total distance of 76 km. I was told by the volunteers at the aid station that I had to cover some more distance to reach the finish line for my category. After a few minutes of rest and a mayonnaise sandwich I ran through the reserve forest only to be told by other runners that the distance to be covered was 12 kilometres. While some of the runners were upset about that, I was not bothered by distance at this point of the race and ran the last eight kilometres to complete it. In total, I estimate that I ran 88 km in 13 and a half hours. I had a solid nutrition plan; among what I consumed during the run were 10 gels, 10 sachets of electrolyte powders and eight sandwiches. The finisher’s medal was beautifully hand-carved in stone. I felt the organizers did a good job. The aid stations were far and few; some of them were strategically located at the top of climbs to give the runners much needed refreshment and rest. The route markings could have been better especially inside the town. I heard that many runners missed the route at times and did five to six kilometres extra. They could have included more trails as 70 per cent of the distance was on tar road. All in all it was a nice event and for me personally, it was very satisfying to run for 13 and a half hours without any injury. Looking back, I think I could have finished two hours earlier but fear of injury, uncertainty about terrain and how my body would react after 50k made me run slowly in the first half and avail many walk-breaks. According to the organizers, a pattern adopted while putting together ultra-trail races is to have a healthy mix of roads and trails – even, more of roads – in the initial editions of events. This is to make the race amenable for the wide range of runners who assemble, many of who are primarily used to the evenly tarred or concrete surfaces of city roads. As the race editions progress, the share of trail is slowly increased. Oil changed the face of the Middle East. The first gusher was in 1908, in Persia, modern day Iran. In the decades that followed, as the oil industry brought wealth to this part of the word, it also altered lives thousands of kilometers away. The southern Indian state of Kerala, located across the Arabian Sea from oil-rich Middle East, contributed manpower to both the oil industry and the economy it fostered. By the 1970s, ` the Gulf’ had set in as a veritable changer of people’s fortunes. Although the trend has matured and likely begun to taper, Wikipedia estimates that by 2008, nearly 2.5 million Keralites were living in the Gulf mainly in the United Arab Emirates, Saudi Arabia, Kuwait, Oman, Bahrain and Qatar. Naveen John grew up in Kuwait; his parents worked there, even his grandfather had worked there. Among the smallest countries in the world, the flat, sandy Arabian Desert covers much of Kuwait. Its highest point is 1004 feet above sea level. Below the desert and its scorching surface temperature lay reserves of crude oil, the black gold that launched an explosion of automobiles worldwide. One hundred and ten years after the first gusher in Persia, Bengaluru – where we met – lay choked in coils of vehicular traffic. Across the Arabian Sea, economies in the Gulf had begun imagining futures less dependent on oil. And Naveen John; he was one of India’s top notch athletes in that greenest of vehicular options – cycling. Born 1986, Naveen passed out from The Indian School in Kuwait City. He shifted to Bengaluru and spent a year attending coaching classes to qualify for medical school. There were means available to get in – management quota, seats reserved for children of Non Resident Indians (NRI) etc. Naveen shunned that. Instead, he joined Purdue University in the US to study electrical engineering. When he started college, Naveen weighed 80-85 kilos; by his sophomore year, he was 90 kilos. Turning point was a Thanksgiving party he got invited to. Following dinner, he played a game of basketball with the host family and was roundly whipped. For the next three months, he ran five kilometers every day, shedding 20 kilos in the process. That phase also triggered a related habit – he kept a training log; it continues to this day. At college he joined an outfit called Habitat for Humanity. Its web page describes Purdue University Habitat for Humanity as “ a nonprofit affordable housing organization.’’ It partners with low income families to build simple, decent homes. A corner of the page had a clutch of photos, one of them showed people cycling. It was with this group that Naveen got introduced to distance cycling; it wasn’t intended, it was more a case of signing up for something and realizing later that the activity involved was cycling. It was a 120 mile-ride. He bought a MTB and went for the ride but couldn’t complete it. However the bug had bitten him. At the time of writing, the Purdue University Cycling Club was still compiling its history. It was founded in late 1982; the prime mover was Mike Cent. He was a runner. In his first semester at college, he injured his Achilles tendon. His roommate Dominic, who was of Italian descent, was a bicycle racing enthusiast. Dominic kept no cycle on campus. “ He just enjoyed the racing culture that is so prevalent in Italian society,’’ Mike notes in a write-up available on the club’s webpage. Dominic got Mike excited about cycling; as it turned out, cycling was also good exercise for strained Achilles tendon. Along the way, Mike bought a Schwinn Super Le Tour and gained followers. In November 1982, the club officially came into existence. 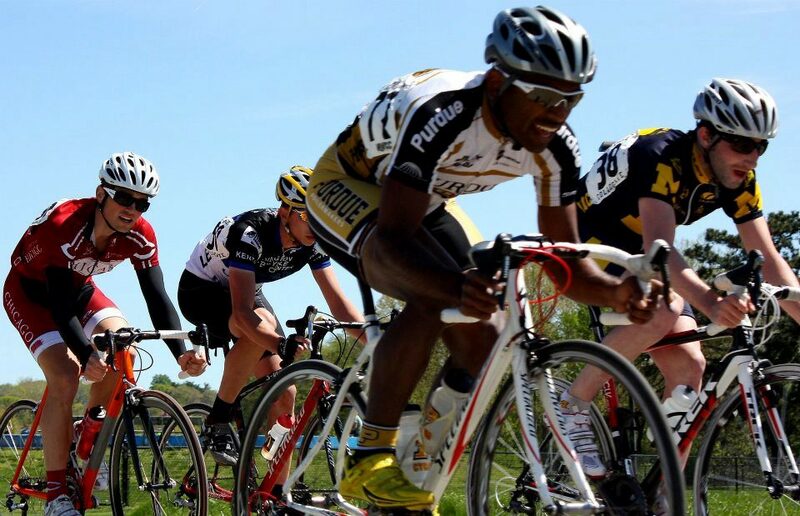 Naveen joined the Purdue University Cycling Club. He traded his MTB for a road bike and started riding with the club every weekend. Cycling improved his fitness levels. He also liked trail running and during his stay in the US, managed to go up 14 of Colorado’s 53 `fourteeners,’ mountains exceeding 14,000 feet in elevation. But he stayed with cycling. According to Naveen, the credit for that goes to the Purdue University Cycling Club. In 2012 Naveen completed his course in electrical engineering. He followed it with an internship. Then he moved back to Bengaluru. The move, prompted by the desire “ to do something satisfying’’ was also driven by a couple of other factors. 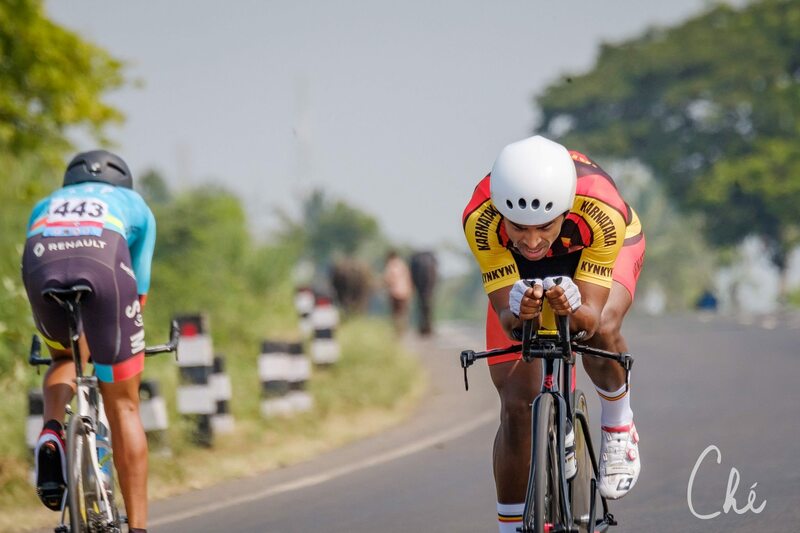 To begin with, as he trained regularly with the Purdue University Cycling Club there was curiosity in the group if Naveen could one day win at the national level in India. The idea engaged Naveen and as he dwelt on it, he felt that it was achievable. Given his newfound interest in cycling and wanting to sustain it, he had also reached out to Bengaluru’s KYNKYNY Sports Club; they had a racing team. He wrote to Venketesh Shivarama of Bengaluru’s Wheel Sports, who is a nodal person for cycling in the city. Venketesh had in turn put Naveen in contact with Vivek Radhakrishnan; both Venketesh and Vivek were involved with KYNKYNY. Unlike overseas, the Indian environment is both old and trapped in the rat race-paradigm of congested, thickly populated country. Anyone trying new things has to wade through well-entrenched skepticism and inertia. It takes a toll. Naveen sensed some exhaustion and pessimism in the feedback he was getting about potentially moving back to India. But he had confidence in Bengaluru’s emergent racing season; he knew that folks like Venketesh and Vivek had done pioneering work in this regard. Upon moving back to Bengaluru, Naveen plunged into bicycle racing. “ I returned to India in July 2012. I remember, I reached Bengaluru on a Friday and my first race was scheduled for Sunday. On Saturday I went for the recce and then raced the very next day,’’ Naveen said. Having raced before in the US, he had asked the race organizers if he could be put in the elite category. However nobody knew him as cyclist or racer. So they told him that he would have to start in Category 2. 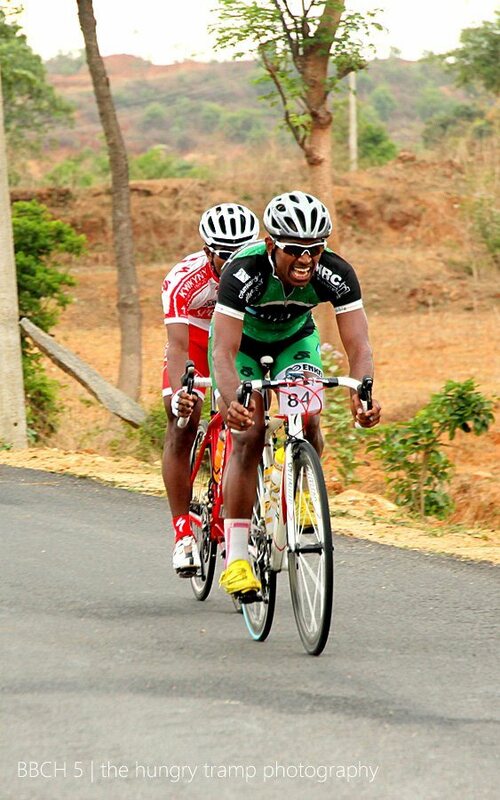 Naveen won that race, which was part of the Bangalore Bicycle Championship (BBCH). He quickly made an impression. Within 3-4 days he was part of the KYNKYNY team and a week after the race, he was in the organizing committee of BBCH. Little over three months later, he was in an unreserved compartment on a train headed to Muzaffarpur in Bihar for the national championship. With him were other members of the Karnataka cycling team, most of them from KYNKYNY. “ I wanted to get a taste of how Indian teams have traditionally traveled to participate in competitions,’’ Naveen said about that stint in the train, adding such travel is definitely not ideal for anyone hoping to perform at a high level in sports. In 2012, he placed fourth in the road race at the nationals. In 2013, he was fourth in time trial; he also supported his friend in the road race helping him finish second. In 2014, Naveen won the time trial. It was his first national title and the first for KYNKYNY; Naveen now represented the club. By 2017, he won three of the elite medals on offer. Talking to those who worked with Naveen or cycled with him, it becomes pretty clear that what sets him apart is the more rounded package he is, compared to regular Indian athlete. A country of economic and social inequalities with an education system that scarcely tries to know its students or bridge disparities, talent in Indian sports is typically a case of having some dominant strength but not all that is required to progress as athlete. Much time is lost battling shortfalls in self and system. Many lose despite their athletic ability. Naveen is different. He is Indian with family from Kerala but grew up in Kuwait and studied in US; so much so that he jokes about not knowing what he actually is. Point is – he grew up free of India’s ground level pitfalls. Post schooling, he was in Bengaluru briefly but soon shifted to the US, home to a robust university education system that respects and values ability in sport. Add to it the educational system he was put through, the college campus he was at and the engineering course he finished – you are not talking of the average Indian athlete here. He brings to bear on cycling, a perspective that spans knowledge of self, knowledge of sport and ability to figure out how to improve. Venketesh Shivarama likely sensed this early when Naveen exchanged mails with him before shifting to Bengaluru. “He is an excellent cyclist. Naveen started out at the basic racing level in the US. When he wanted to move back to India, he sent me a mail. I told him to come to Bengaluru. He is technically strong, well read and motivated. From 2005 onward, Bengaluru had been taking steps – baby steps – in bicycle racing. With Naveen around, the pace of that evolution picked up,’’ Venketesh said. Venketeswara Rao Navanasi aka Bikey Venky is a Bengaluru based-cyclist who has cycled with Naveen. “ Naveen is methodical. He doesn’t think short term. He plans and executes long term. He emphasizes the importance of having a coach and a plan that is specific to achieve your goals,’’ Venky said. Both men also pointed to another quality in Naveen – he helps fellow cyclists and contributes back to the cycling community. Soon after return to India, Naveen chose to compete in the time trial. It provides insight into how Naveen’s mind works. An individual time trial (ITT) sees cyclist race against the clock on flat or rolling terrain. There are also track-based time trials and team time trials (TTT). Naveen chose the time trial to start with because “ variables are significantly less’’ in that discipline. Eliminate variables; your ability has better chance to reach you to your goal. Time trial also put the spotlight on him as an individual athlete, something required if what you are attempting is to break into a community and gain acceptance in it. But his obsession with focus doesn’t end there. He compares the run up to a national championship or any such elite event, to a Mars Mission. “ That’s how the way to these championships must be treated. You build a cocoon around yourself and your teammates. Now I know how to do that,’’ he said. If you ruminate on it, factoring in the naysayers and booby traps lurking in the Indian environment, the merit in that cocooned approach becomes visible. He is also clear that Indian athletes need to work harder. Compared within same age category and discipline, an Indian cyclist does not train as hard as his European or American counterpart. Uniquely, some of the dilution is visible even in the parameter of sport as followed in India. Performance cycling typically straddles four disciplines – individual time trial, team time trial, road race and criterium (a short form of the road race). In India, the road race is 120-140 km long. Internationally, road races are longer; at the Asian championships, 170 km is minimum stipulated distance. 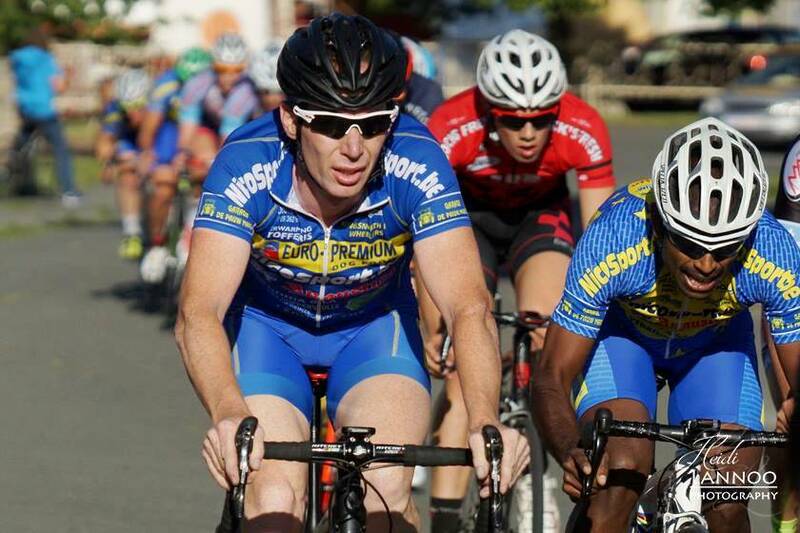 According to Naveen, two things are critical to be a top notch cyclist – work rate and consistency. Work rate basically refers to mileage accumulated by the end of the year. It also includes other aspects pertaining to the totality of being an athlete – rest, recovery protocols, fundraising, sponsor activation responsibilities, taking on support gigs etc. Arguably, Naveen started late in the sport. At age 31, in 2017, he became the first Indian to win both ITT and road race at the nationals. He used to train 20-22 hours per week. Overseas, athletes trained up to 30 hours. Following the 2017 nationals, Naveen had his first block of 30 hours-training. “ Two things happened – I didn’t die; I did better in terms of performance,’’ he said. Next goal is 32 hours. “ There is no short cut for hard work. All that Indian cyclists assume is holding them back – none of that is correct. It is work rate that holds us back. You have to live for improving work rate. At one time my place of residence in Bengaluru was hindering it. I solved it at one stroke,’’ Naveen said. When Bengaluru started filling up with traffic and space for cycling declined within the city, Naveen who was staying at Sarjapur, didn’t waste time complaining. He simply shifted to Devanahalli on the outskirts. The main thing he required to sort out for this was find a way to pay the rent. He did that by coaching more to bridge the deficit. The move to Devanahalli not only brought him closer to Nandi Hills, which is a favorite with runners and cyclists to train at, it also changed his fortunes as an athlete with more time and space for good quality training. Occasionally, Naveen invites young athletes he works with to come over for intensive training camps. “ You won’t hear words like Olympics and Tour de France from me because I know what it takes to compete at those levels. I am aware of only the next step I should take,’’ Naveen said. In 2016, a friend who was documenting Naveen’s journey in photos, asked him: what next? Naveen struggled for a proper answer. He knew that if you have been an amateur racer for long, the obvious thing to do next is to become professional. So he blurted out that fantasy – he wanted to become a professional cyclist and do so outside India. Too this end, he did a lot of cold emailing; he aimed for Division Three on the Union Cycliste Internationale (UCI) website. Cam Whitting, who runs cyclingiq.com, helped. Naveen managed to connect with a couple of teams from Australia, eventually signing up with a team called: State of Matter / MAAP. It was previously known as Charter Mason Giant Racing. However there were some problems. He struggled to raise funds for the Australian foray; he was also delayed in reaching Australia. Naveen’s contract was from January 2016 to December 2016. Since he was going to race with a cycling team, he applied for a sports visa. As it turned out, aside probably from cricketers, not many athletes from India had applied for a sports visa to Australia after the Sydney Olympics of 2000. That caused delay. 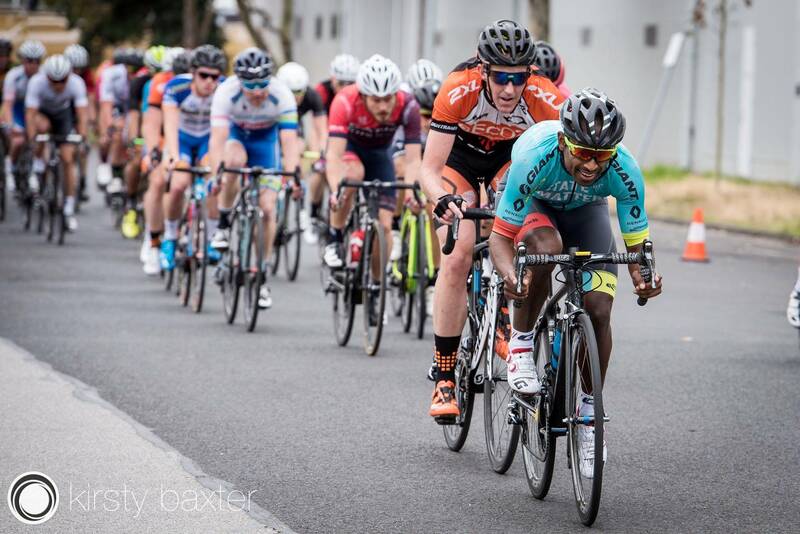 Reaching Australia with some of the major races already over, Naveen could participate in only amateur races in the domestic circuit. Even that was an experience for the field was strong. 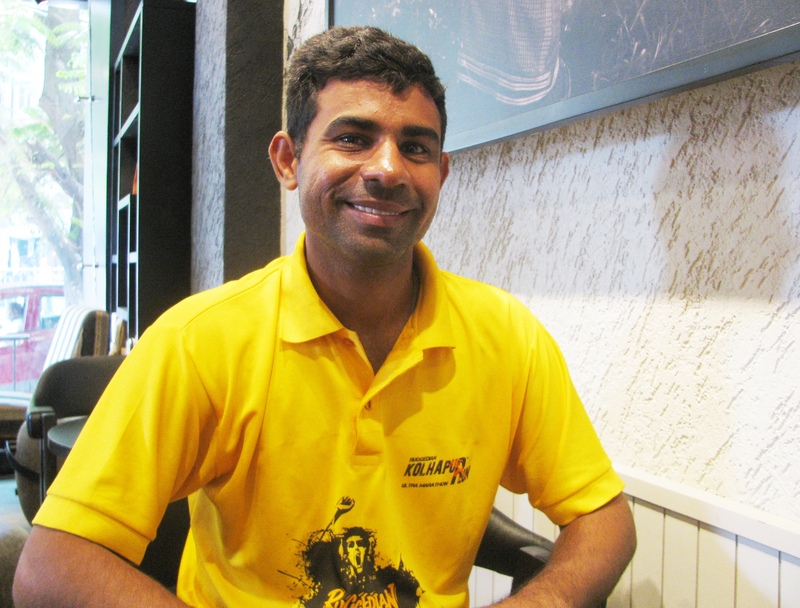 Naveen stayed part of the team roster for 2016. State of Matter was later disbanded. But a big race did happen for Naveen that year. In October 2016, he and fellow Indian cyclist Arvind Panwar, took part in the UCI World Championship held in Doha; Naveen participated in ITT. He finished 55 in the competition (Arvind finished 61), seven and half minutes behind the winner, Tony Martin of Germany. 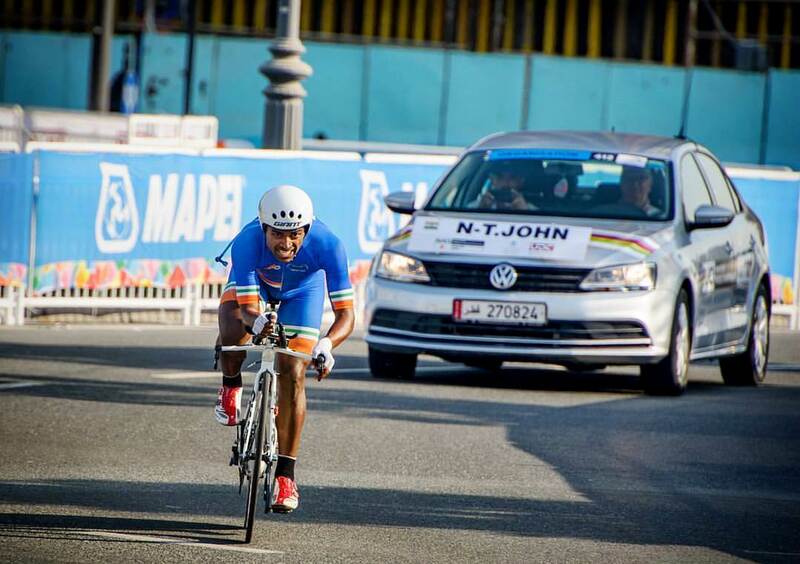 Next year, Naveen participated in the Asian Cycling Championship held in Bahrain. There, in the ITT, he placed thirteenth in a field of twenty separated by a gap of five and a half minutes from the winner. Naveen and Arvind then participated in the road race and finished with the main peloton, the first time India was doing so in some seven years. 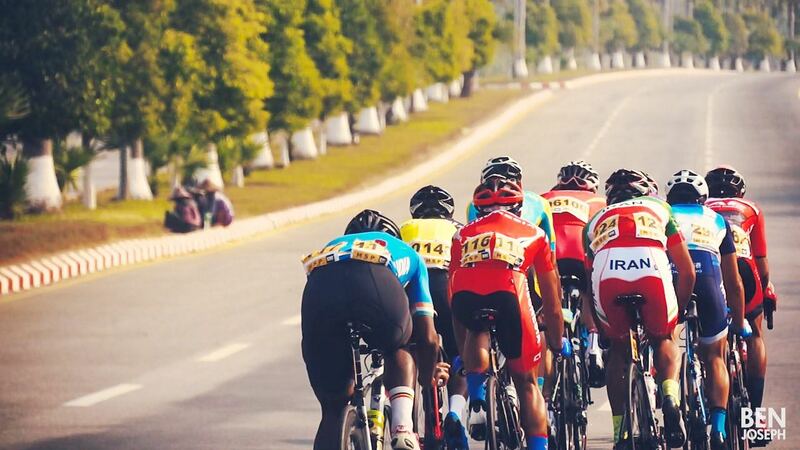 In early 2018, they were back at the Asian Cycling Championship; this time held at Naypyidaw, the new capital of Myanmar, a city with roads as wide and flat as aircraft runways. Here, Naveen moved up to tenth position in ITT with a gap of three and a half minutes separating him from the winner. Naveen and Arvind performed better in the road race too. According to Naveen, a factor influencing the strength of national squads is how much, their athletes race with private cycling teams. Cycling is expensive. Any national federation would be challenged to create the hours of top quality cycling required to shape champion cyclists. The way out is to join private teams and train and race with them. Japan, Kazakhstan and Chinese Taipei are usually the strongest squads at Asian championships. Although it is not very active in the private racing scene, Iran also makes the cut. 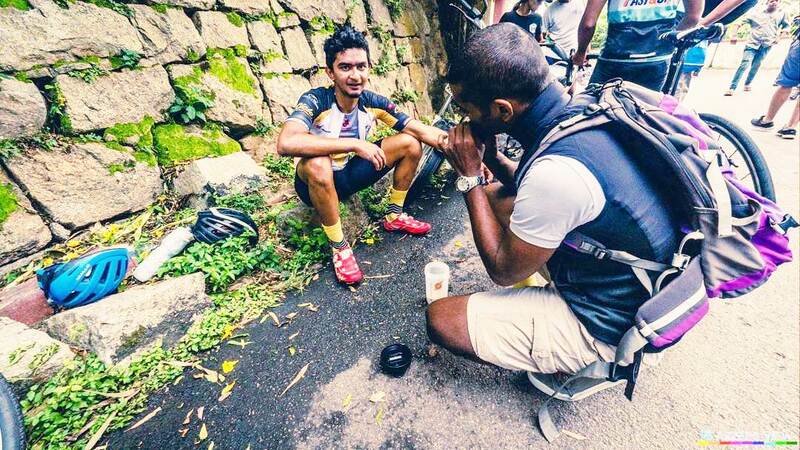 Naveen’s most significant foray – one that holds much meaning for Indian cycling – was perhaps something else. Richard Moore is a fine author, who has brought alive, stories from athletics and cycling. Here’s the opening paragraph from one of his essays in the 2014 book Etape: The French call it pave’. It sounds exotic and benign – it could be a succulent cut of beef – but for cyclists it has a different meaning. It is the pave’ that defines Paris-Roubaix, the ` Hell of the North’ one-day classic that includes twenty odd sections of cobbles, or pave’; hell because these cobbles are not the small stones polished by thousands of cars in a city, but large, uneven boulders planted in mud, arranged to run in narrow strips across the plains and fields of northern France and Belgium. Cut to Bengaluru’s MG Road and the café Naveen and this author were at, end-February 2018. Some distance from where we sat, running parallel to MG Road, was Church Street. It was in the final stages of being refurbished into a quaint road of interlocking tiles that reminded of Europe’s cobblestone-streets. Cobblestones provide a rough, bumpy surface for cycling but they are part of the ambience making up a kermesse. The kermesse is a form of Dutch bicycle race currently most popular in Belgium, especially the northern Flanders region. Europe is the beating heart of bicycle racing. 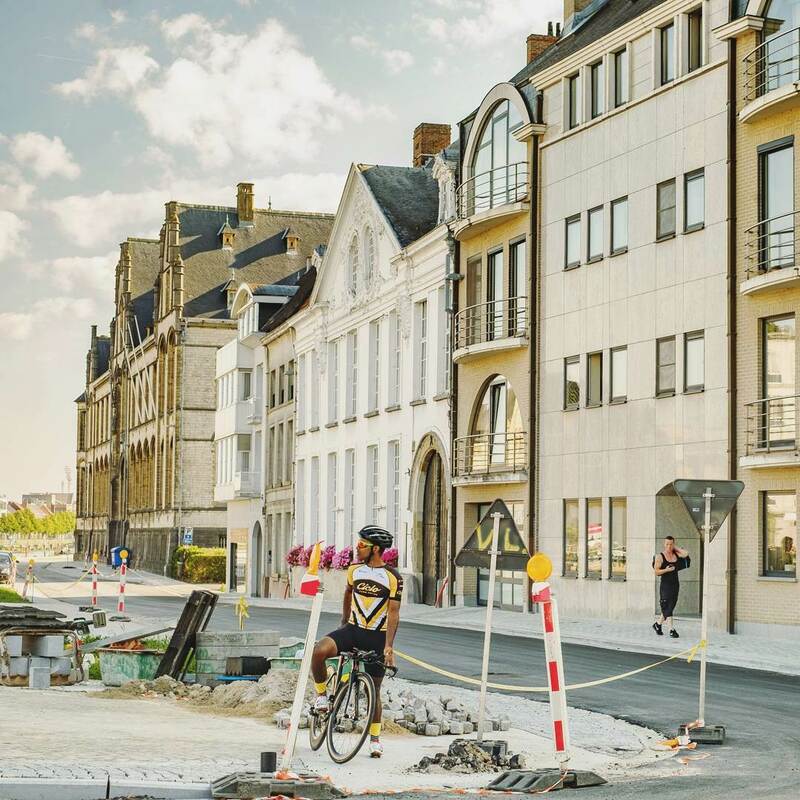 Within Europe, nations like France, Belgium and Netherlands represent the home of cycling culture. In Bengaluru, KYNKYNY, after a phase of being supported by the reputed American bicycle brand: Specialized, began disbanding in 2015. “ KYNKYNY aspired to be the first Division Three team from India. It was ahead of its times. We were unfortunate in that we didn’t have 12 strong riders, who were consistently good enough for that journey along with related support,’’ Naveen said. As the team disbanded it found in its possession a small cachet of funds. That money opened prospects to attempt races overseas. Naveen’s research took him to the writings of Ed Hood who had documented accounts of British racers cutting their teeth in continental racing and progressing to the top echelons of the sport. It mentioned the importance of racing in continental Europe, in shaping cyclist’s reputation. In continental Europe, Belgian cycling was noted for speed and power, France for distance and challenging terrain. Naveen was at that time in good form. After winning the ITT at the 2014 nationals he had followed it up with a win at the 2015 National Games. There was also the fact that – amazing as it sounds – it cost less to race in Belgium than in India. Such is the disparity in economic efficiency as measured in terms of what all it costs to race. 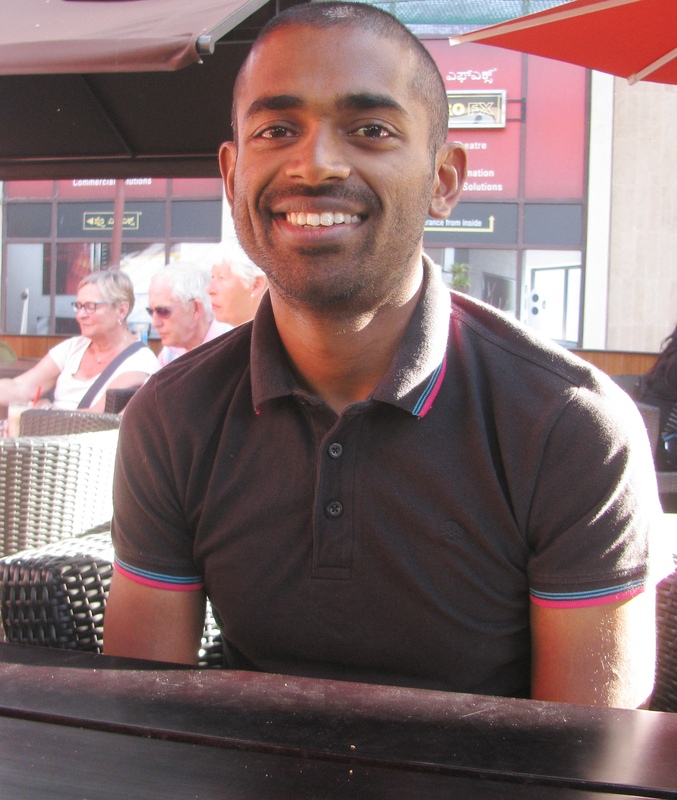 In 2015, four Indians – Naveen among them – spent 60 days in Belgium; altogether and across all of them, they participated in 20 races. Naveen managed to finish at four races. The best position he got was twentieth, secured in the last event he raced at. “ The experience was an eye opener,’’ he said. It showed that the future for Indian cyclists was not to wait for the sport’s systems to emerge in India but to leverage the systems already existing outside India. In 2017, seven cyclists from India traveled to Belgium for another go at races there. This time Naveen participated in 22 races; he finished 21 and crashed at one. “ The average amateur kermesse is faster than the Indian nationals. The distances are also longer. Indian courses are typically straight. Over there, you tackle bumpy, uneven roads. You don’t complain. Cobblestones are an integral part of Belgian racing. There are entire races built around it,’’ Naveen said. Visiting Belgium and racing there is now set to be an annual affair. 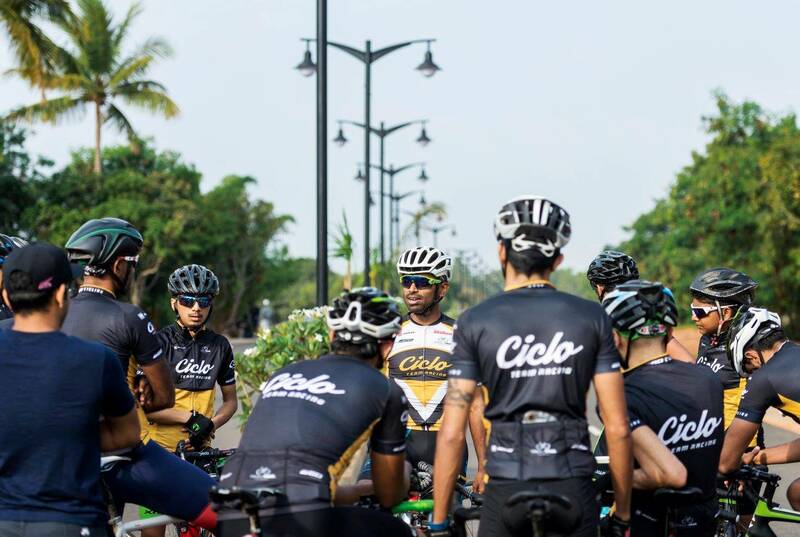 It is the bedrock of activities planned around Ciclo Team Racing, Naveen’s new team, which is backed by 2go Activewear, TI Cycles and Absolute. It has been an intense trip so far for electrical engineer schooled in Kuwait, attending college in the US and cycling in India. “ The Purdue Cycling Club was a small nurturing environment. It was all about keeping people involved long enough to help them find out what they can do. Small clubs with seniors, mentors, good coaches, an informal setting – that is the ideal incubator for talent,’’ Naveen said looking back to where and how his tryst with cycling began. His background as engineer has also helped in the journey – he is able to take challenges apart into smaller tasks, analyze them and attempt a solution. Besides competing, Naveen also coaches. A term he used for the work he saw himself doing in Indian cycling was – human engineering. It referred to the contribution he wished to make towards building the people and systems that will be part of the sport five to ten years from now. For now, it is all electric enough to keep engineer glued to cycling. Dichaon Kalan is a village, located in Najafgarh tehsil of South West Delhi. It is mentioned as among places President Richard Nixon of the US visited during his July 1969 official trip to India. On Wikipedia, the bulk of the village’s recent history is however composed of notoriety earned between 1992 and 2015 as backdrop for a series of gang wars; that inevitable mix of real estate business, violence and politics. On a gentler note, the online encyclopedia says, the majority of people in Dichaon Kalan are farmers and the village accounts for a giant’s share of the cauliflowers sold in Delhi. “ I am sure you have heard of Najafgarh. Virender Sehwag, the cricketer? – He is from Najafgarh,’’ Hari Om said to help me position Dichaon Kalan on the map. We were at a café close to Regal Cinema in Colaba, Mumbai, incidentally a location involved in the India-visit of another US President, Bill Clinton. In 2000, on the Mumbai leg of his trip, Clinton had spent time at a shop selling antiques and then sat down for a chat with a few of India’s young and elite at a nearby café. Both places were across the street and a few strides away from where we were. Nothing as detailed seemed available of Nixon’s time in Dichaon Kalan. 1969 was long before the Internet. Hari Om was born March 1984 in Dichaon Kalan. They were four siblings – two brothers; two sisters. Life was tough. Income from farming was meagre. To compound matters, his father had a kidney problem. Hari Om studied on scholarship; he was a good student. Early morning he worked alongside his father in the fields and then left for school. The family worked the fields themselves growing cauliflower and grain. “ Our focus was studies. The goal was to ensure that what happened to the parents didn’t repeat in the lives of the children,’’ Hari Om said. Following school, he spent two years pursuing BSc (Mathematics) at a college in Delhi. Alongside, he kept applying for the entrance test to be a sailor in the Indian Navy or an airman in the Indian Air Force. Two reasons drove this. First, after all that the family had endured, the security of a government job with promise of regular salary, attracted as means to be useful to parents and siblings. Second, Hari Om had a decent track record in the National Cadet Corps (NCC), a military cadet corps open to school and college students. Those completing the course have no liability to join the armed forces but are given preference over normal candidates should they apply. In his final year of graduate studies, Hari Om was admitted into the navy. After six months of basic training in Orissa, he shifted to the gunnery school at Southern Naval Command, Kochi for further training. While he was there, the navy sought volunteers for Basic Mountaineering Course at the Himalayan Mountaineering Institute (HMI), Darjeeling. Hari Om volunteered; he completed the course held in March 2004 with an `A’ grade. Later that year, the Indian Navy had a successful expedition to Mount Everest. 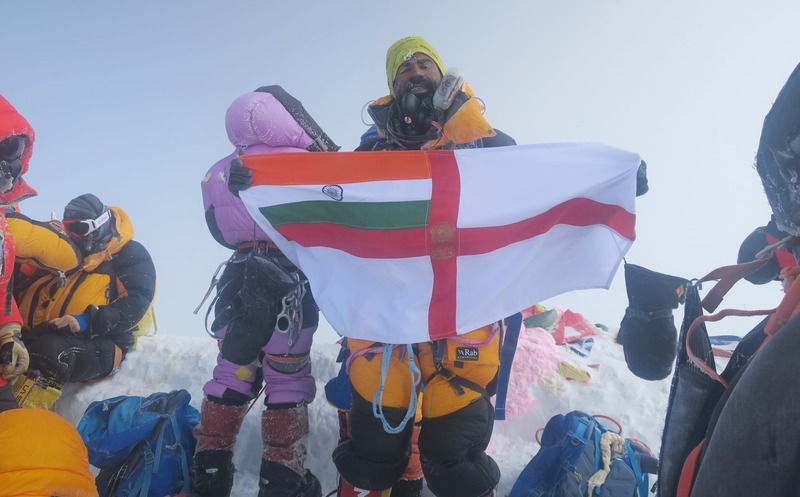 According to Hari Om, one of the summiteers of that expedition – Surgeon Lt Cdr Viking Bhanu – asked him if he would like to join an expedition to climb a virgin peak of over 6500m in East Karakorum. The expedition was flagged off by Admiral Arun Prakash. The peak was successfully climbed. Hari Om was among those who summited. It was the start of his career in mountaineering. In 2005, he was chosen for an expedition to Lakshmi (6983m), a peak near Indira Col on the Siachen Glacier. Conditions were quite bad on the mountain. Although they managed to fix rope up to 6650m, deteriorating weather conditions ensured that they wouldn’t be able to set up summit camp. So they decided to climb up to about 6500m and later, do a traverse to Indira Col. However in that climb up to 6500m, at around 6200m, a large slab of snow broke off triggering an avalanche with serious injury to some of the climbers. Helicopters had to be called in to evacuate the injured. That was the end of the expedition. A footnote would however play out ten years later. Soldiers who spend more than 28 days on the Siachen Glacier are eligible for the Siachen Medal. Hari Om estimated that in all, he had spent 45 days on the glacier. His eligibility was considered and the medal, awarded. Following the Mt Lakshmi expedition, Hari Om went to Nehru Institute of Mountaineering (NIM), Uttarkashi, to do his Advanced Mountaineering Course. He then volunteered for Indian Navy expeditions to South Pole and North Pole. He wasn’t selected. It was during this time that he commenced running. The idea was to stay fit. Be good to be selected as and when adventure calls. In 2007, he did his first full marathon at the Standard Chartered Mumbai Marathon (SCMM – now Tata Mumbai Marathon / TMM), covering the 42km-distance in 3:35. Impressed, his commanding officer dispatched him to Manali, to do his course in skiing. In 2007 and 2009, the navy’s expeditions to the Polar Regions occurred. During this phase, mountaineering took a back seat. Hari Om continued to run. He ran the half marathon at the Chennai Marathon. “ What kept me running was the desire to be good enough to climb when the opportunity presents itself,’’ he said. By 2014, Hari Om was posted to Mumbai, having moved through Chennai and Delhi before that. Amid these transfers, he also completed his intermediate course in skiing. A keen swimmer, he also got into open water swimming. He completed the annual sea swimming competition conducted by the navy in Mumbai in 2007, 2015 and 2017. In January 2015, he participated in that year’s SCMM. Here he met Commander Sunil Handa, a naval officer with passion for running, who in the course of his posting in Mumbai would become one of the city’s best known ultramarathon runners. 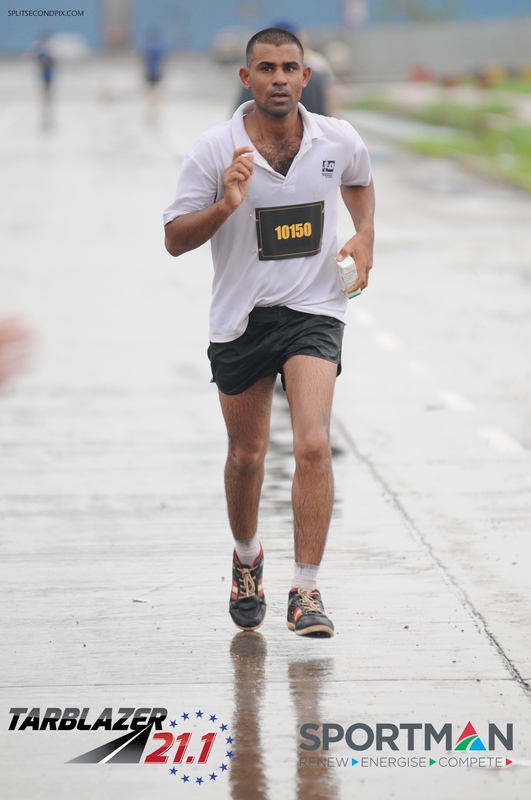 When Commander Handa sought volunteers for the annual 12 Hour-Ultra in Mumbai, Hari Om stepped forth. That was their first outing together. Following this event, he was cleared to participate in the Khardung La Challenge of September 2015, a 72km-ultramarathon over India’s highest pass with a road through it. There, Hari Om finished tad outside the cut off time. It was his first taste of a real ultramarathon. “ Commander Handa is the person who made me what I am in running,’’ Hari Om said. 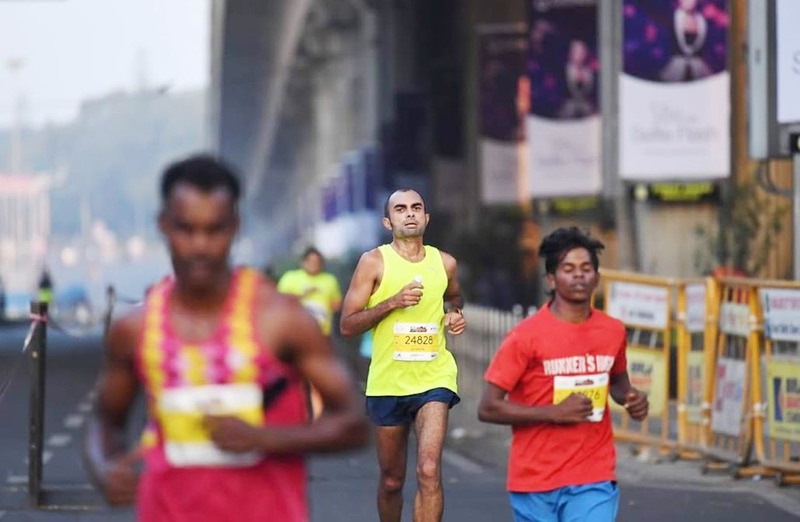 Thanks to the senior officer Hari Om gained a window to several events in Mumbai ranging from the monthly Bandra-NCPA half marathon organized by Mumbai Road Runners (MRR) to the Vasai Virar Mayor’s Marathon (VVMM). He also repeated his intermediate course in skiing – this time from the training institute in Gulmarg – as he had at that time become a member of the navy’s skiing team for the National Winter Games. In 2015, Hari Om marked his return to mountaineering; he was part of the navy’s expedition to Mt Saife (6161m) in Garhwal. In 2016, he got to know that the navy was planning to attempt Everest again. He started working on his fitness hoping that he would be called. In his mind, Everest (8848m) had always been significant. In May 2016, the navy had a pre-Everest expedition to Satopanth (7075m). It was a pre-monsoon expedition by the Western Naval Command. Hari On, who was part of it, ferried load up to Camp 1 but came down with what he thought, was a throat infection. It was a diagnosed as potential High Altitude Pulmonary Edema (HAPE). Sent back to NIM, the closest mountaineering institute in the region, Hari Om was devastated. Given the medical report, he was also not recommended for the navy’s post monsoon expedition (part of pre-Everest climbs) planned to Mukut Parbat (7242m). That was when he decided to join the navy team attempting that year’s La Ultra The High, a punishing ultramarathon in Ladakh. 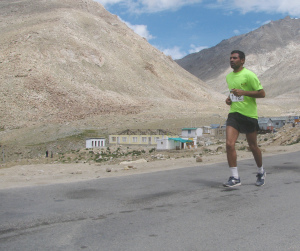 The navy runners were enrolled in the event’s 111km-race category, wherein they would run across Khardung La. 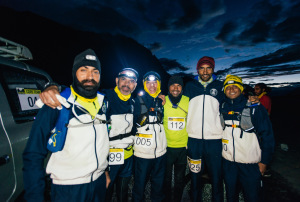 This was the first time the navy was formally participating in an ultramarathon, as a team (for more on how this team was formed and how it trained please visit this link: https://shyamgopan.com/2016/09/16/the-indian-navys-first-ultramarathon-team/ For more on the 2016 edition of La Ultra The High, please visit this link: https://shyamgopan.com/2016/09/16/the-captain-the-teacher-the-warrior-and-the-businessman/ ). As part of acclimatization for the race, Hari Om climbed Kang Yatse II (6200m). On race day, he finished third in the 111km-category. Encouraged, he sought inclusion in the team heading to Everest. But he wasn’t called up. Hari Om admits to being disappointed by this. Not one to give up easily, he took one month’s leave and went for an expedition on his own. He knew that he required to successfully climb a peak of over 6500m to be considered for the navy team attempting Everest. In September 2016, there was an expedition by army paratroopers heading to Bhagirathi II (6512m). Although belonging to a different branch of the defence forces – the army, they were empathetic to Hari Om’s request and included him in the team. He emerged one of the summiteers. With that, he volunteered for Everest and was called for selection trials scheduled at the Armed Forces Sports Medicine Centre in Pune. Sixty volunteers reported; 30 – Hari Om among them – were short listed for winter training on Siachen Glacier. While this was on, in October, Hari Om participated in a Half Ironman (triathlon) held in Hyderabad. It entailed 1.9km swimming, 90km cycling and a half marathon. It was his first experience of competition cycling and he suffered an accident on the cycling leg. But he completed the Half Ironman successfully. For their winter training, the navy’s Everest team was dispatched to the army’s mountaineering institute at Siachen. Training spanned December 2016 to mid-January 2017. Twenty four of those who attended made it to the final team; of that the climbing component comprised 18 persons, Hari Om was one of them. Further training for the team was scheduled in Delhi. While in the city, Hari Om ran the IDBI Half Marathon of February 2017 completing it in 1:32. On March 31, the navy team left for Kathmandu in Nepal. They reached Everest Base Camp on April 20 having done a long walk-in tracking the same path Tenzing Norgay and Edmund Hilary took in 1953. According to Hari Om, that year – 2017, climbing windows were less; so were the number of successful summits. The navy team tasted success in two stages – the first batch reached the summit on May 24; the second on May 27. Hari Om was part of the second batch. “ For me, it was a dream come true,’’ he said. For his contribution to the expedition, Hari Om was among those selected for the Nao Sena Medal (devotion to duty) in 2018. In August 2017, little over two months after his Everest-climb, Hari Om attempted the 222km-segment of La Ultra The High. To prepare for the race, the navy team trekked in Ladakh’s Markha Valley. On race day, Hari Om began well but somewhere before the first cut-off he veered off the road, fell and injured his left knee. He reached South Pullu an hour before cut off. But with both knees paining by now, his progress slowed down considerably. He opted to DNF (Did Not Finish) at the 111km-mark. His timing was 15 minutes slower than the 20 hour-cut off for 111km. It was a lesson. Looking back, he appeared to have rushed things – come in to a punishing race too soon after Everest, an endeavor in climbing that was great for the spirit but one that had likely taken a toll on the body. After La Ultra The High, Hari Om rested for 15-20 days to recover from the race and the lingering effects of Everest. But he was back in early October, placing third in the 60km-category under the ` skyrunning’ segment of Hell Race. 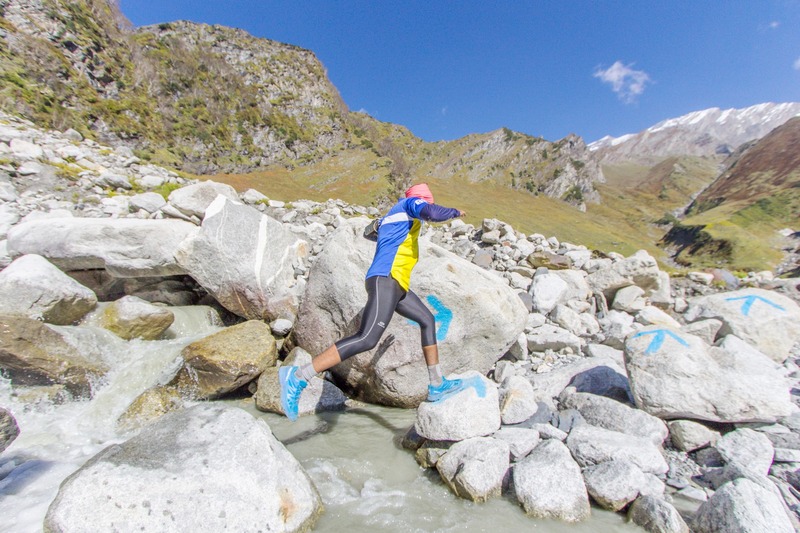 Days later on October 7, he finished first in the 100km-category of the Bhatti Lakes Ultra; his delight multiplied by the new Salomon shoes he was gifted by the race organizers. Then, on October 28, he finished first in the 100 miler-Ultra Tuffman Beach Championships in Goa, covering the distance in 23:20. In January 2018, he completed the full marathon at TMM and in February, the 161 km-category of Run the Rann (he ran this race in Kutch to collect UTMB points), where he ended up fifth overall. He proceeded soon thereafter to Kolhapur where a friend had recommended him to be brand ambassador for the Kolhapur Marathon. He also ran a 50km ultra there, completing it in 4:32. When I met him in Mumbai – a figure clad in shorts and T-shirt, seated on the steps of Regal Cinema – the battering from all this racing was obvious. He was limping – that classic runner’s limp; pronounced at start, forgotten as leg warms up and the mind embraces distraction in talk around running. Equally obvious was that optimism typical of those into extreme sports. Hari Om spoke of getting into trail running and hopefully finding sponsors for the races he wished to attempt overseas. “ I like running very much. I find peace doing it,’’ he said. Back in Dichaon Kalan, amid all the notoriety gang wars fetched it, the village now has a man who climbed Everest and runs the ultramarathon. 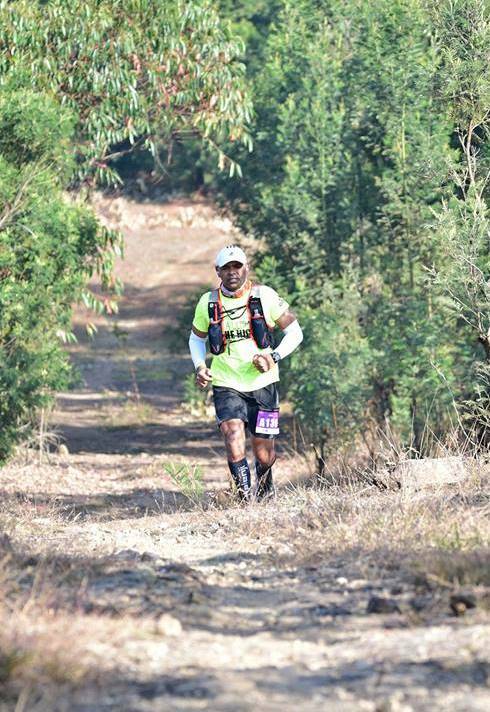 We speak to Athreya Chidambi, runner of multiple distance categories but above all, a lover of trails. 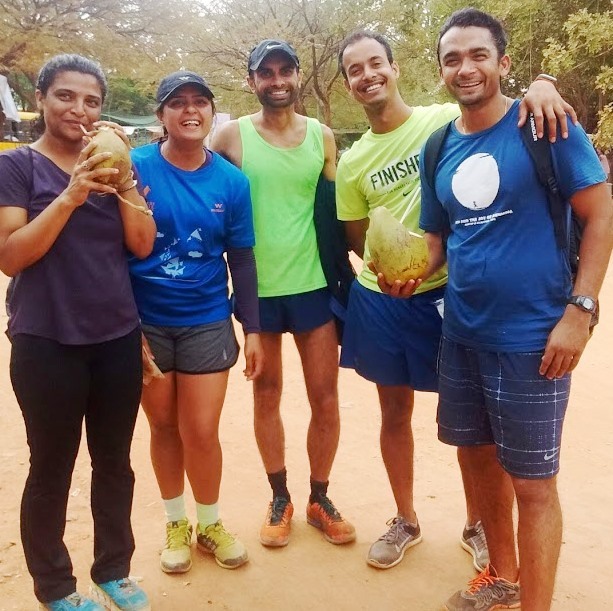 The Auroville Marathon is a much loved event in the Indian calendar for amateur running. It is mostly on trails and unpaved roads. What makes it special is also something else. There is no timing chip. It is a minor difference from the regular running event but one that is profound if you are the sort declining life with blinds. Removing timing chip from the frame restores to running dimensions missed at races. Every year the Auroville Marathon gets its faithful seeking a paradigm apart from the killer competition of Indian cities. “ Auroville is one marathon I try to do every year,’’ the wiry, bearded man said. The fragility of his view was evident as he spoke. Right there in the café on Bengaluru’s MG Road, the table next to us was resonant with high decibel conversation of selling some product, moving consignments around and clinching deals before competition did. Can you be happy these days, doing something just for the love of it; without beating somebody? Good question. We play to win. In world dominated by the brain’s analytical and engineering faculties (a quality we increasingly bring to sport too), Athreya Chidambi aspired for a career in art. He was born in 1978 in Bengaluru, growing up thereafter in the city. As a school student he was active in sports – mainly basketball and football – but constant companion all along, was drawing and sketching. His father worked as a management consultant; his mother taught at the same school Athreya attended – Mallya Aditi. Following school, he joined Karnataka Chitrakala Parishat in the city to do a foundation course in art. But that inevitable child of the Indian rat race – the question: what employment prospects will you have? – wormed its way into his environment. None in his family had studied art and while successful artists exist, a career in art has never been without its share of ups and downs. Indian imagination on the other hand values security. So a tweak was made. He shifted to Melbourne in Australia to do a course in multimedia; that subject seemed safer bet for livelihood than pure art. However, his return to India coincided with the dotcom bust. “ It took a while to get a job,’’ Athreya said laughing. When it came, it was with a company called Thought Gun. He worked there for about a year and then joined Rediff.com in Mumbai as a web designer. It was during the two years he spent in Mumbai, that the first edition of the Standard Chartered Mumbai Marathon (SCMM / now called Tata Mumbai Marathon) happened. Curious, he participated in the event’s seven kilometer-Dream Run. In 2004, Athreya shifted to London where his sister stayed. He had a “ working holiday visa.’’ London was a runner-friendly city. It had large parks and small hills that could be easily accessed by public transport. There were pavements to run on. People gave way to pedestrians. When one runner saw another, a “ hello’’ or “ good morning’’ was said. There were running events spanning distance categories ranging from five kilometers to multi-day events and they were spread throughout the year. Plus, you had access to a wide variety of clothes and equipment for running. January 2005, Athreya started training to run; he also signed up for a half marathon – it was called Three Forts Challenge – scheduled for May that year. Three Forts was held in a small town outside London. The run went off well for Athreya, he finished in two hours. “ I was very happy with it,’’ he said. Trusting his longstanding acquaintance with sport and not yet knowing the details and micro-details of progression in distance running, he decided to aim next for a full marathon. He signed up for the Budapest Marathon of October 2005. He isn’t sure what motivated him to vault from first half marathon to first full marathon so soon and so early in his running career. “ One of my seniors from school had done the New York Marathon. I suspect that may have prompted me to register for Budapest,’’ Athreya said. In June 2005, Athreya joined London’s Serpentine Running Club. The club’s origin is linked to the London Marathon, one of the world’s top running events; its first edition was in 1982. To prepare and train for the 1983 edition of the event, a group of runners had formed a club, since well-known as Serpentine Running Club. Wikipedia describes it as a cross country running club that draws members from across Greater London. A member of Serpentine is called a “ Serpie.’’ Athreya found their outings helpful; they were quite structured with distances assigned and pacers allotted for each category. Besides regular runs, there were hill-running sessions every Saturday. Athreya got by on a mix of getting tips from coaches and figuring out things himself. It was trial and error. Luckily injuries were few. Aside from a minor brush with shin splints, there wasn’t anything major. In October he completed the Budapest Marathon in 03:22:38. However his good fortune didn’t sustain. At the next marathon he signed up for, an event in London, he got cramps. 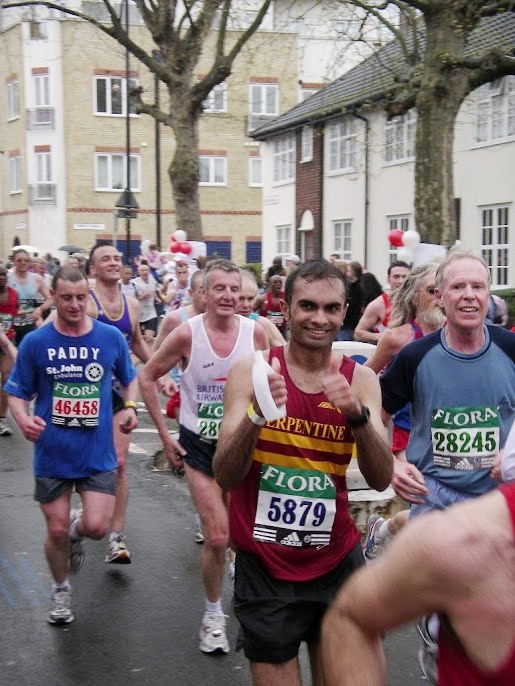 Then in April 2006, Athreya ran the London Marathon. “ Entry was by lottery and I just proved lucky. Two of my friends who had been in the UK longer, didn’t get it. I think I was just lucky,’’ he said. The London Marathon was an experience. “ I had never seen a crowd so big. Everyone comes out to cheer. Belonging to Serpentine, which is a major club, also helped; you are noticed and encouraged. At London, it is hard not to run even if you are struggling,’’ he said. He completed the London Marathon in 03:41:49. Besides the above mentioned races, during his stay in UK, Athreya also ran the Nike 10k, Luton Marathon, Watford Half, Hastings Half and Clapham Common 10k. For food on the table, he worked freelance. He traveled a lot in the UK; he also visited Hungary and Norway. In 2006, soon after the London Marathon he returned to Bengaluru. To keep his running alive, he initially trained near his house. Then, he joined Runners for Life (RFL). In Bengaluru, he set his eyes on the Bangalore Ultra, deciding to attempt the 78k category they had then. “ To my mind, there is difference between how the west approaches running and how India does. There, things are structured. Here it is more a case of being bitten by the bug, experimenting and carrying on. I got no formal education here on how to progress or effect transitions from one distance category to another. When it came to the ultra, I just decided to try it,’’ Athreya said. He planned his route to Bangalore Ultra with the Kaveri Trail Marathon (KTM) of September 2007, in between. It was designed by the organizers as a stepping stone to Bangalore Ultra. Athreya completed KTM with timing of 03:57:47. He found that he liked running on trails. You can take a road-run for granted because the surface is even. Not so, trails. “ On trails you have to watch every step. I also find that I recover faster from trail runs. After most of my road-running events, I am tired for three to four days. With trail runs, I recover in a day or two,’’ he said. Notwithstanding KTM, Athreya was laid low by a stomach bug during the Bangalore Ultra. He had to DNF (Did Not Finish) at around 50 kilometer-mark. “ For a long time I was dejected and depressed. Slowly I got over it,’’ he said. The reversal he suffered remained in the head as unfinished business. Next year he enrolled for the Great Tibetan Marathon (GTM), which used to be held in Ladakh. A week before the event he tore a ligament. He ran GTM wearing a brace, finishing the event at altitude in approximately 04:32:19 hours. Next on the agenda was to address that unfinished business at the Bangalore Ultra, the route to which lay through KTM. This time he DNF-ed at KTM (conditions were quite warm and he got cramps) but completed the 75 kilometer-category of Bangalore Ultra, successfully. He finished in 09:05:43. Apart from some exceptions, the bulk of Athreya’s running has been in peninsular India. One likely reason for this was a factor he repeatedly kept observing the evening we met – Bengaluru may have become chaotic and its traffic, horrible, but it still has that weather, which is probably the best among big Indian cities for running. 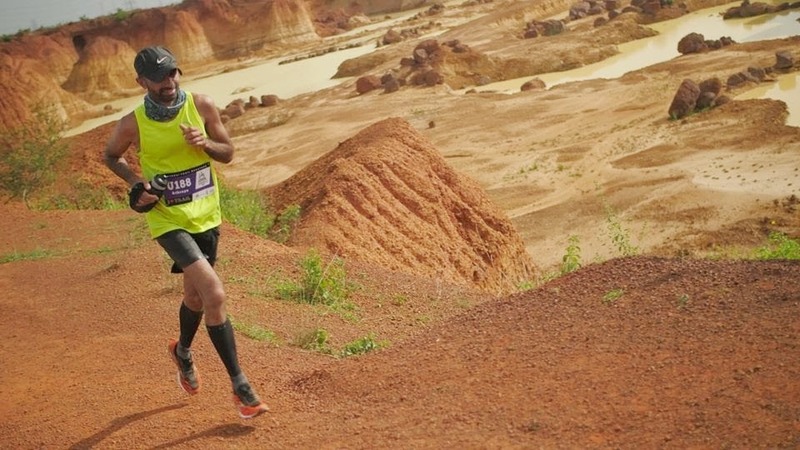 Like Auroville, which he frequents to run free of the tyranny of timing, two other events that surface consistently on Athreya’s annual list are KTM and Bangalore Ultra. In 2009, the year he got married, he ran the 75k category at the Bangalore Ultra. In 2010, he did the 100k covering the distance in 12:06:18. He also made a foray into a business that brought a touch of nature to people’s homes. For quite sometime now, Bengaluru with its mix of young people, educational institutions, software companies and well-traveled executives has been India’s city of ideas. After they got married, Athreya’s wife who worked at Infosys, quit her job. She and three others – Athreya among them – commenced a start-up that tapped the opportunity to grow plants in the balconies of houses; it was called mysunnybalcony.com. For regular job, Athreya also worked at a company called Logica. By now, Athreya’s distance running was well past the days of introduction to the sport. In 2011, he got into a 24 week-training plan for ultra-running, the first time he was doing so. That year he got his personal best at KTM – 03:14:24. It was followed by the 50k category at Bangalore Ultra, completed in 03:58:56. This phase of running was different for a few more reasons. For the first time, Athreya felt competitive in a race. 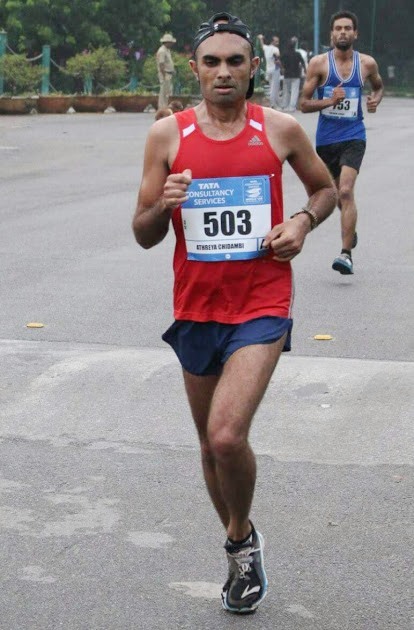 By now he was also running Bengaluru’s annual 10k (associated originally with Sunfeast and later with TCS), covering the distance in around 40 minutes. He also trimmed his preferred ultra-distance to 50 kilometers; that’s what he has mostly stuck to since at the Bangalore Ultra and similar runs elsewhere. In 2012 Athreya joined Aditi Technologies. There wasn’t much running in 2012-2013. In 2015, he ran the 50k category of the Javadhu Hills Ultra. Athreya explained why trail running suited him. First, he likes nature. “ I have always been an outdoors person; I am not the city type,’’ he said. Second, he is the sort who usually trains alone. He likes that solitude. “ I can’t take crowds. I typically train on my own. In Bengaluru, I normally train on a mud track near Ulsoor. The other place I train at is Nandi Hills. Traffic is less there and I get to do both road and trail-running,’’ he said. Third, he likes small races. “ They don’t end up extremely competitive like the races in cities. They remain a personal experience. Running has always been a personal experience for me. If I do better, it is for my own self. Trail running is hard initially. To get through distances all by yourself on trails, is mentally tougher than managing a city based-race where you have people egging you on,’’ Athreya said. He covered the 50k distance category at Javadhu in 04:16:21. In 2015 he quit Aditi Technologies and partnered his runner friend, Dharmender, to see if coaching runners attracted as profession. Dharmender, who used to work at KPMG effected that switch successfully. Athreya didn’t find it his cup of tea. But that phase indirectly helped for the regimen of coaching at Bengaluru’s Kanteerava Stadium and adhering to training plans, improved his performance particularly in the half marathon and 10k. In 2015, he ran the half marathon in Hyderabad in 01:26:33 and the annual 10k in Bengaluru in 39:30 minutes. By 2016, he had lowered the timing in 10k at this event to 37:41 and at another similar event, to 37:06 minutes. In 2016 Athreya also made a departure from his 50k-fixation in ultra-runs, to attempt the 110 kilometer-category at Malnad Ultra. He knew the organizers and had been part of the team, which did the recce. Athreya wrote in his blog about why he chose this race: As most people progressed to running distances of 75k, 100k and 24 hours, I decided to stay at 50k. 50k had become my go-to race distance. I stuck to trail races and wanted to get better at the distance before I went back to doing ultras. And it did get better – I got stronger at the distance but I had got comfortable. I needed to get out of my comfort zone and see where I was at in terms of longer distances. 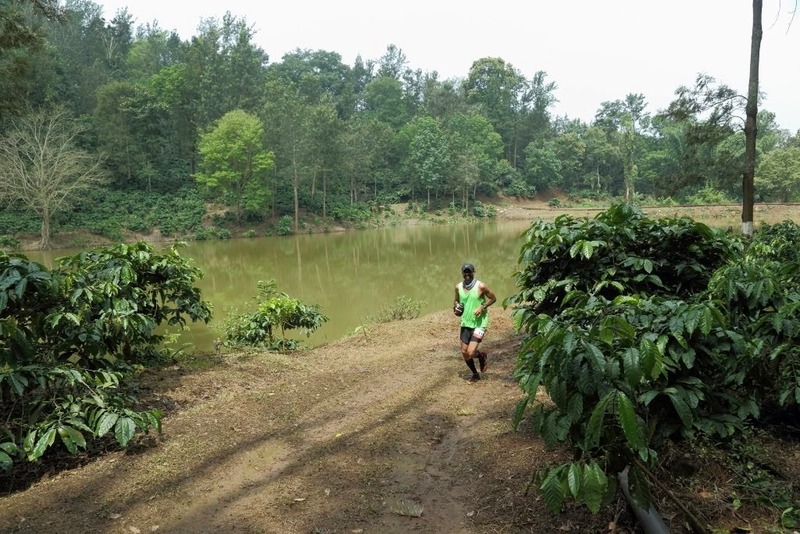 The Malnad Ultra route was through coffee estates. To train for the event, he ramped up weekly mileage to roughly 100 km per week, peaking at around 120 km. He did several 40k runs around Nandi Hills and once, an 80k. He trained alone. On race day, Malnad went well for Athreya till around the 80k-mark. Then things started to go downhill. Amid the running, he had missed having lunch. By the time he reached the last 10 kilometers, he was tired and delirious. He finished in 13:45:55 hours. What doesn’t satisfy stays as unfinished business. Following Malnad, he ran the half marathon at Bengaluru’s annual marathon. 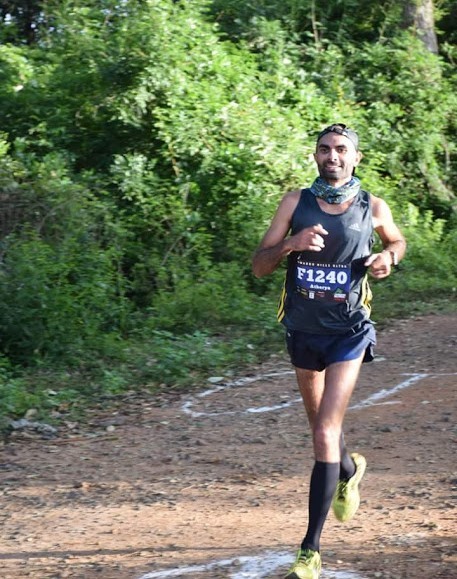 In 2017, he came back to Malnad and did the 110k all over again (this time the course was slightly different with more elevation), completing it in 13:11:45 hours. Then as before, he ran the half marathon in Bengaluru, finishing it in 01:28:35. Same year he also did the 75k at Javadhu completing it in eight hours. Another race Athreya ran in 2017 was the Chennai Trail Marathon. “ Many of us got lost while running that,’’ he said. Getting lost is one of the problems faced in trail-running. In trail-runs, the location is typically away from crowded city centers, people are few on the course and off it, markers may be inadequate and as happens sometimes – volunteers may give you directions but dropped off in wilderness, they may be as confused as you are. In some trail-running events, runners have to do the navigation themselves. If you are terribly competitive or seeking money’s worth, things going wrong can be an irritant. Racers sometimes come off cursing event organizers for what went wrong. I asked Athreya how he reacts to an incident of getting lost. “ For me, I guess, it is okay, part of the deal. I try to enjoy that also. I would probably go mad if it was a city that I got lost in. On trails, I have no expectations. If I get lost, I get lost. That’s one more way to know a place,’’ he said. In the running he has logged so far, Athreya has had several podium finishes in his age category, spanning both ultra-distances and the shorter ones. At the time of writing, what he wanted to try next was a 100 miler. “ I want to do it well, do it within a certain time,’’ he said. As for places he would like to run in, there was Kutch, Khardung La, Hong Kong and Nepal’s Annapurna circuit. When people meet, they exchange visiting cards. Athreya’s was sky blue in colour with letters printed in white. The card introduced him as designer of useful experiences and illustrator. The reverse of the card was yellow with a sky blue circle at its center. Within the circle were a running shoe and the tag line: designer on the run. His website was no different. It declared unabashedly: this website combines my love for running and design. 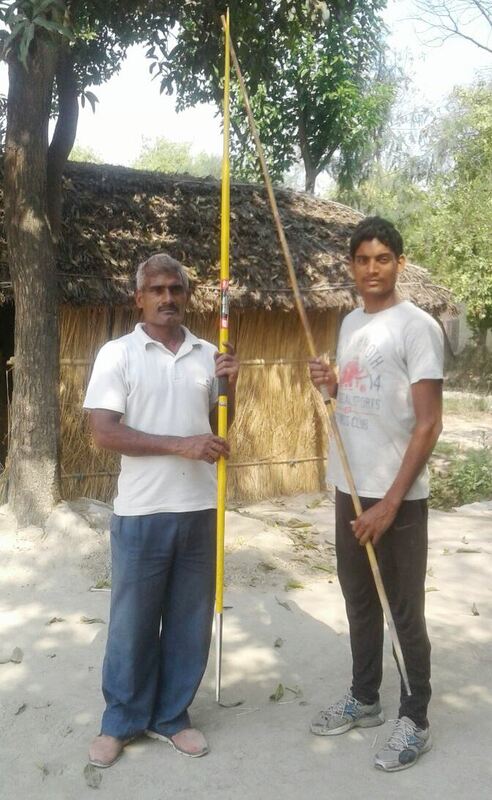 “ Rohit is very happy,’’ Sabhajeet Yadav said about his son who has commenced training with a brand new javelin. According to him, Bhasker Desai sponsored the Nemeth javelin; their friend Melvin made the necessary arrangements for sourcing the javelin and dispatching it. “ We collected it from Meerut yesterday,’’ Sabhajeet said. Sabhajeet Yadav, a farmer from Dabhiya, Uttar Pradesh, is a well-known amateur runner with several podium finishes in his age category. Rohit is a former gold medalist in javelin-throw at the World School Games. 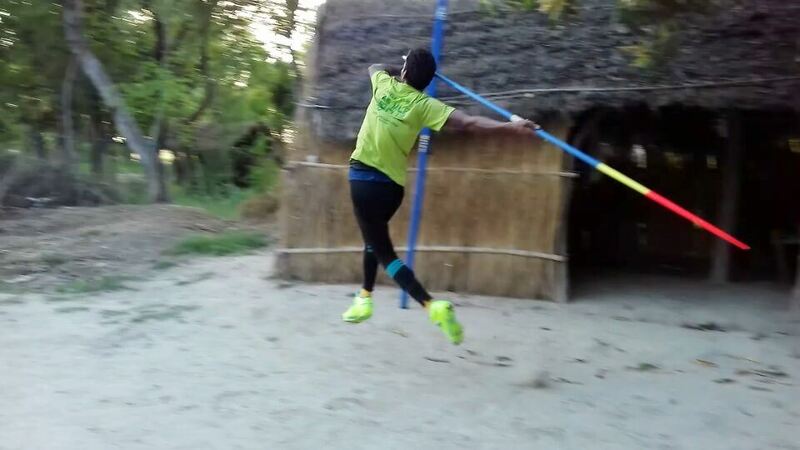 Asked about the new javelin and how it felt in training sessions, Rohit said that it made a lot of difference. A promising young athlete, returning to sport after failing an anti-doping test, wants to procure a good javelin. This is an article on amateur runner Sabhajeet Yadav and his son Rohit, who was gold medalist in javelin-throw at the 2016 World School Games. March 1, 2018. Tucked away in the sports section of the morning newspaper was a report about a 29 year-old Indian athlete returned positive under anti-doping tests conducted by the newly set up Athletics Integrity Unit (AIU). The sport in question – yet again javelin-throw – reminded of another incident less than a year ago. A farmer from Dabhiya in Uttar Pradesh, Sabhajeet Yadav, 62, is known in the world of Indian amateur running as a consistent podium finisher in his age category. He counts on the prize money he gets from running as additional income stream. One of his personal projects has been training his son, Rohit, to become an athlete of repute in the javelin-throw. Mumbai’s Lokmanya Tilak Terminus is where this blog catches up with Sabhajeet. Having come for a marathon in town, secured a podium finish and with an hour to spare before train to UP departs, he would sit down for a chat and cup of tea. On some of these occasions, he had mentioned his desire to see Rohit participate in the Olympic Games. Javelin-throw is one of the oldest disciplines at the Olympics. According to Wikipedia, it was part of the pentathlon at the ancient Olympic Games. In those days, it was judged for distance and target. Javelin-throw became part of the modern Olympics at the 1906 Intercalated Games held in Athens, an event that has stopped being counted as an official Olympic Games by the International Olympic Committee (IOC). While we are used to seeing the javelin thrown with one hand, in the late nineteenth century and the early part of the twentieth, there was a phase when judging at competitions was based on the aggregate best a person could achieve throwing separately with the right and left arms. This practice featured at the Olympics just once, in 1912. After that, it faded. Three countries – Norway, Sweden and Finland – have dominated javelin-throw in the men’s category. They account for almost 50 per cent of the Olympic medals given out so far in the discipline, for men. Women’s javelin-throw was added to the Olympic program in 1932. As interesting as the sport’s history, is the evolution of the javelin. For a long time, javelins were made of wood with a steel tip. In the 1950s, pole vaulter-turned javelin thrower, Budd Held of the US, introduced the `Held Javelin,’ which was hollow and aerodynamic. Its later models were made entirely of metal. These new javelins flew farther but they also tended to land flat, making for some landings that were difficult to measure accurately, Wikipedia says. Experiments to redesign started in the early 1980s. They were fueled by one more concern – the javelin was now being thrown by athletes so far that it threatened to exceed the dimensions of a normal stadium infield. In 1984, Uwe Hohn of East Germany (since unified with West Germany to become Germany) had set a record of 104.80 meters. The redesigned javelin, approved in 1986, saw its center of gravity moved forward marginally, the surface area in front of the center of gravity reduced and the same behind, increased. These innovations helped contain the distance traveled and ensure that the projectile landed stuck in the ground. Interestingly this design was also tinkered with in the competition to achieve longer throws. In 1991, the authorities outlawed javelins with serrated tails and reset records with retrospective effect. According to his profile, available on the website of International Association of Athletics Federations (IAAF), Rohit Yadav was born in 2001. News of him training in his village appeared in the media some years ago in a report following Sabhajeet’s podium finish at the Mumbai Marathon. The report engaged as window to the family’s drive and ingenuity. 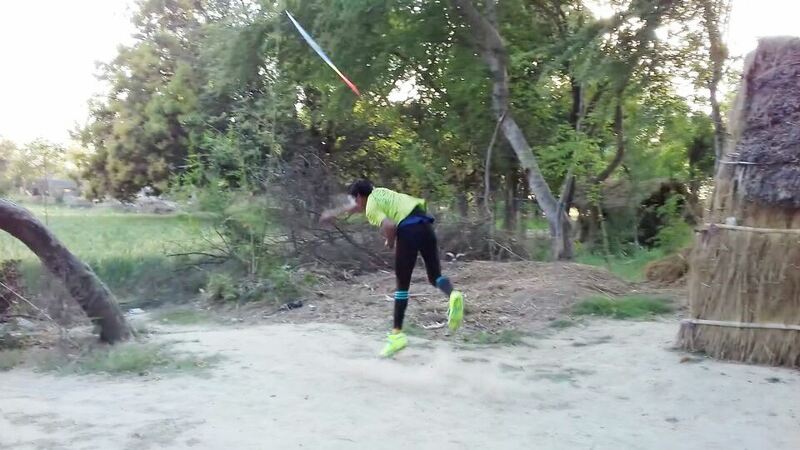 Unable to afford a modern javelin, Rohit trained with a homemade one. In times when the javelin’s design and engineering are as important as athlete’s ability to extract a world class throw, a homemade javelin is inadequate means to train. “ I made that javelin from bamboo. I had a photo of a javelin to guide me. I did not follow any established specifications about size, weight or anything like that. The crudely made javelin was not good for the hands. Rohit used it for two years,’’ Sabhajeet said. The path Sabhajeet and Rohit took, of making their own javelin, would be what India calls jugaad. Happening in underprivileged circumstances, jugaad addresses a need with none of the finesse or elegance that marks well made, well designed products. What shows through is refusal to be stopped. The underlying curiosity shouldn’t be dismissed. It was the same curiosity – albeit in a different, more sophisticated environment – that yielded the Held Javelin. Prior to the 1950s, nearly all the best throws in the world had been with javelins made in Finland, using northern birch. Budd Held, who was studying engineering at Stanford University, observed one day that one of his Finnish javelins traveled farther than the rest. As per a detailed account available on the Internet, Held studied that javelin closely, took accurate measurements and discovered that the front section of the javelin was slightly larger in diameter than the tail section. The wood in the front section was also bit softer. All this was probably an oversight in manufacture but the improved travel resident in that single specimen and subsequent analysis of it, was what led Held to come up with his own design – the Held Javelin. 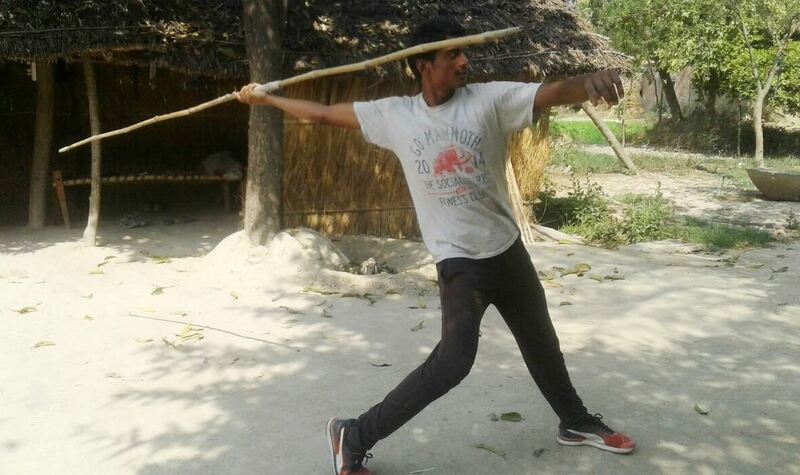 Training with homemade javelin didn’t stop Rohit from graduating through the ranks. It helped him reach state level-events, where better javelins were available for athlete. “ We then bought a javelin for Rs 12,000 from Patiala,’’ Sabhajeet said. By July 2016, Rohit had secured a gold medal at the World School Games with a throw of 72.57 meters. In May 2017, he got silver at the second Asian Youth Athletics Championship held in Bangkok. In May 2017, the media reported that Rohit had failed a dope test conducted by the National Anti-Doping Agency (NADA); he had tested positive for the banned substance stanozolol and was set to be stripped of the silver medal he won in Bangkok. The news shocked Sabhajeet; it was keenly tracked by those in the amateur running community, many of who knew Sabhajeet. Eventually, Rohit was given a one year-ban. According to Sabhajeet, the ban is from May 21, 2017 to May 21, 2018. At the time of writing, Rohit’s best throw on record – as available on his IAAF profile – was 76.11 meters (for comparison, the national record is 86.48 meters set by Neeraj Chopra while the world record is 98.48 meters held by Czech athlete, Jan Zelezny). When we brought up the subject of Rohit a few months after he was banned from competing for a year, Sabhajeet was in tears, unable to handle the topic. He claimed his son was innocent and the family had no idea how stanozolol had got into him. Over time the setback appears to have got processed in the head. 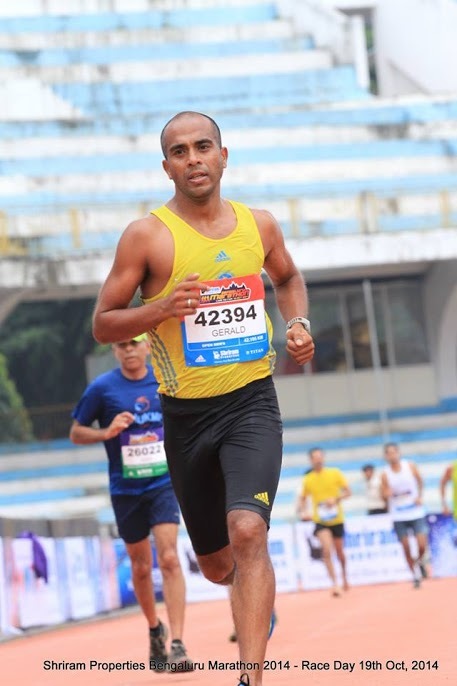 By the time we met him for a chat after the 2018 Tata Mumbai Marathon (where he earned a podium finish for the seventh time), Sabhajeet was more hopeful and imagining the way ahead once Rohit recommenced competing at events (he would have to work his way up all over again). The father-son duo’s plan is to attempt the qualifying round for the 2018 Youth Olympics scheduled to be held in October in Buenos Aires, Argentina. “ The qualifying round will be held two months ahead of the Games. If he qualifies he will be sent for the Games by the government. As of now, he will continue to train here in the village. If he does well and we get a reliable coach, then he will be sent for training,’’ Sabhajeet said. One of the things Sabhajeet would like to have for his son’s journey ahead, is a modern, competition-standard javelin to train with. The best javelins are manufactured overseas. According to data on the Internet, leading names in the business include Nemeth Javelins (company founded by Miklos Nemeth, Hungarian athlete who was gold medalist in javelin-throw at the Montreal Olympics), Nordic Sport and OTE javelins. The javelin will have to be imported and Sabhajeet believes that the cost could be anywhere between Rs 80,000 to 100,000. 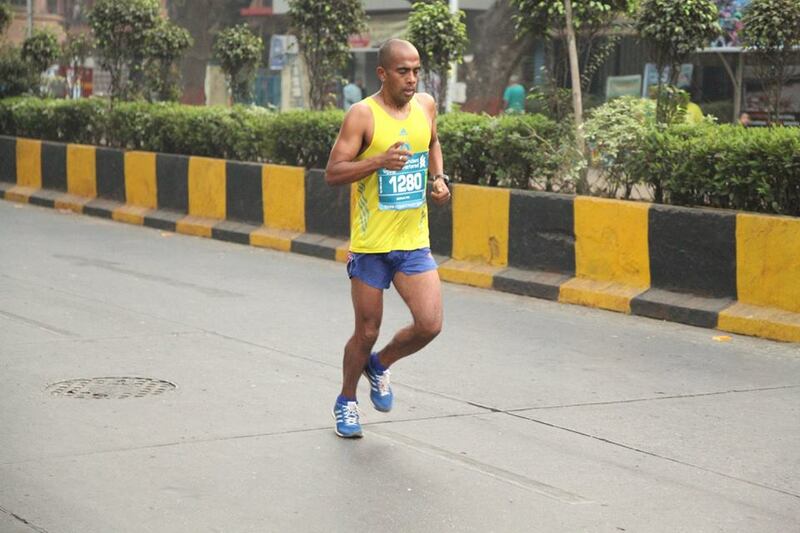 Mumbai based-businessman and amateur runner, Bhasker Desai, has been Sabhajeet’s benefactor for several years. He has stepped in to do the needful. But the intervention, while addressing an immediate need, will have limited relevance because Rohit will move into the senior category in a couple of years’ time. There is disparity in specifications (mainly, weight) between competition javelins used in the senior category and the one, Rohit can use now. A mechanism to support his journey in a more sustained fashion will need to be looked into.